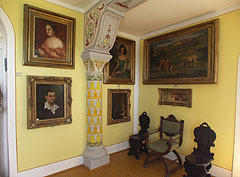 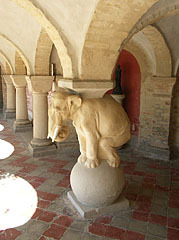 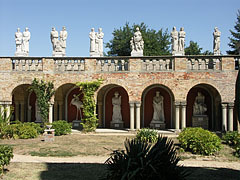 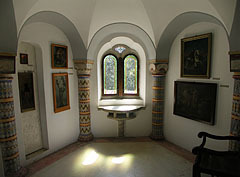 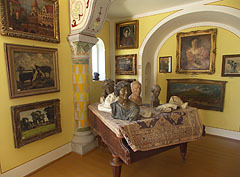 "Yard of the Hundred Columns", viewed from the "Pointed Tower"
Glimpse from the balcony to the "Elephant Garden"
Picture gallery, pictures on the wall of the "Yellow Room"
Outlook from the bower of the "Elephant Garden" to the so-called "First Terrace"
Balcony of the picture gallery from the "Elephant Garden"
Column with an elephant in the "Elephant Garden"
The garden of the "First Terrace"
Rose garden on the "First Terrace"
The vaulted gate of the "Yard of the Hundred Columns"
The Bory Castle and the parapet of the "First terrace"
The "Flag Tower" and the "Pointed Tower" from the arcades of the "Yard of the Hundred Columns"
A detail of the "Yard of the Hundred Columns"
The spiral staircase of the "Pointed Tower"
The "Yard of the Hundred Columns" from the "Pointed Tower"
A premise of the "Pointed Tower"
Room in the "Pointed Tower"
The residental tower and a detail of the "Yard of the Hundred Columns"
A stone vase with mosaic tiles in the so-called "Lower Garden"
Jenő Bory (1879-1959) was a sculptor, painter and architect, lived in Székesfehérvár, Hungary. 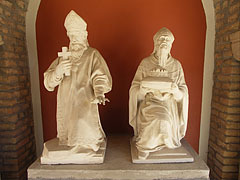 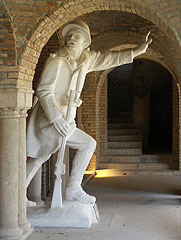 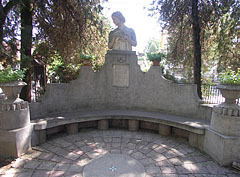 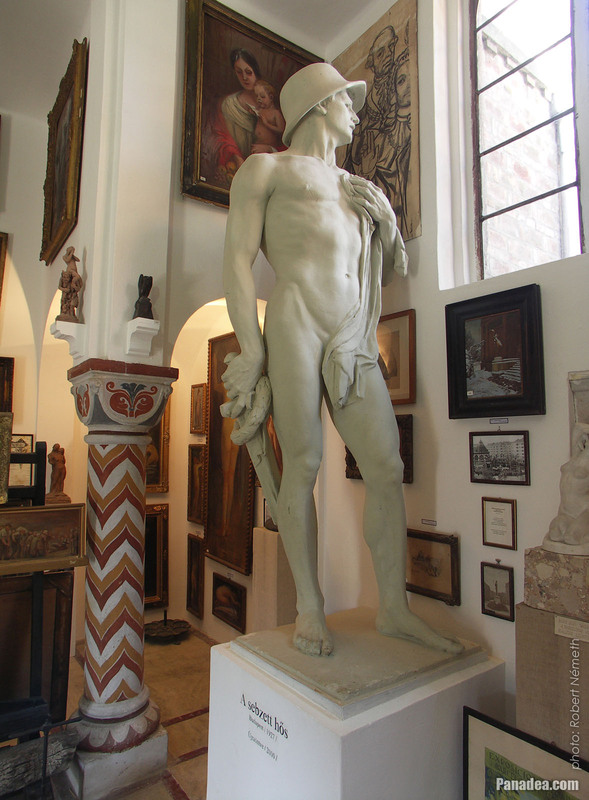 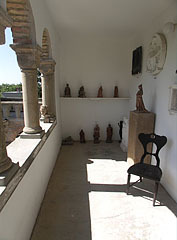 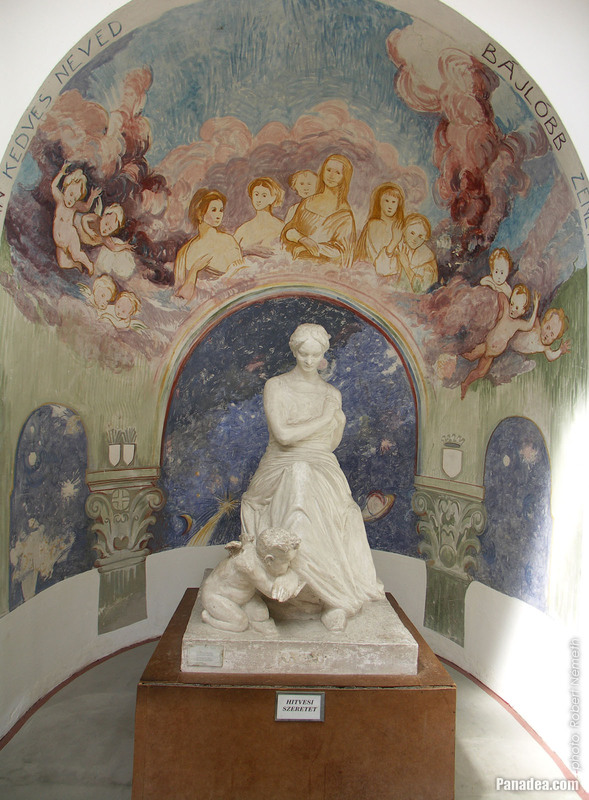 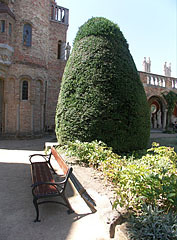 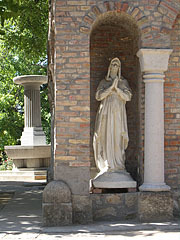 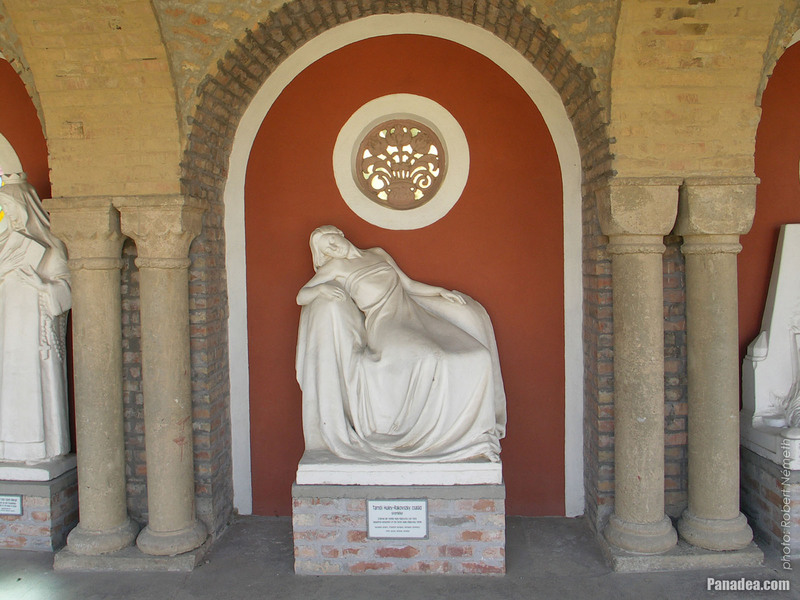 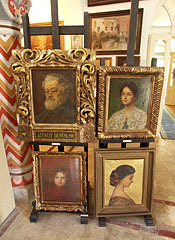 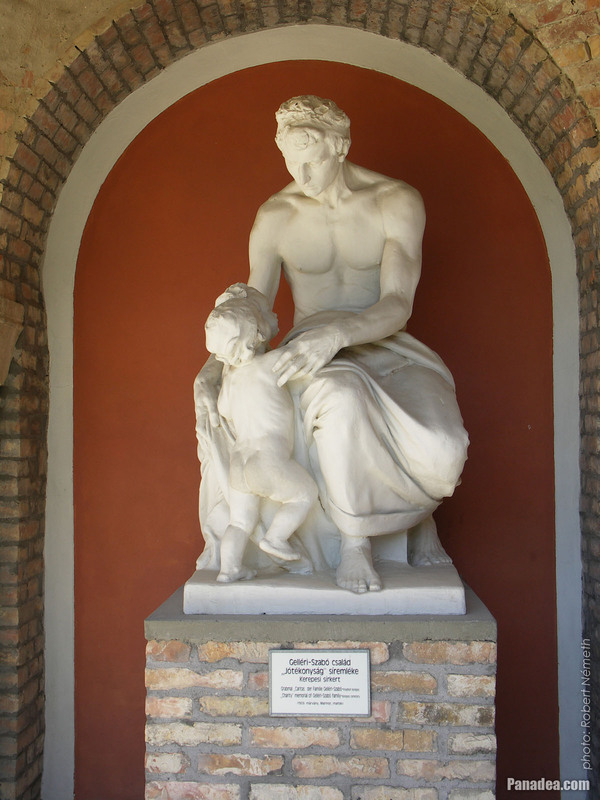 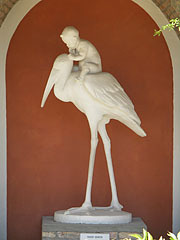 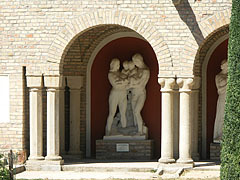 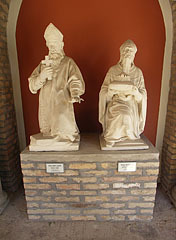 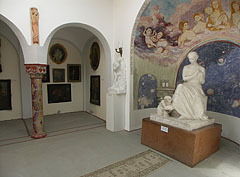 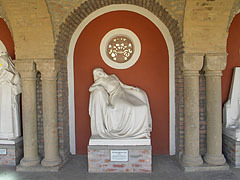 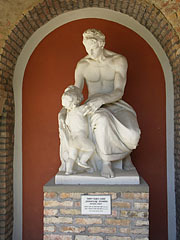 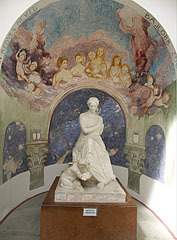 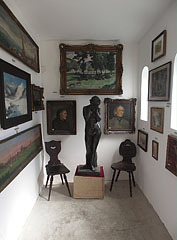 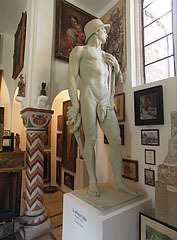 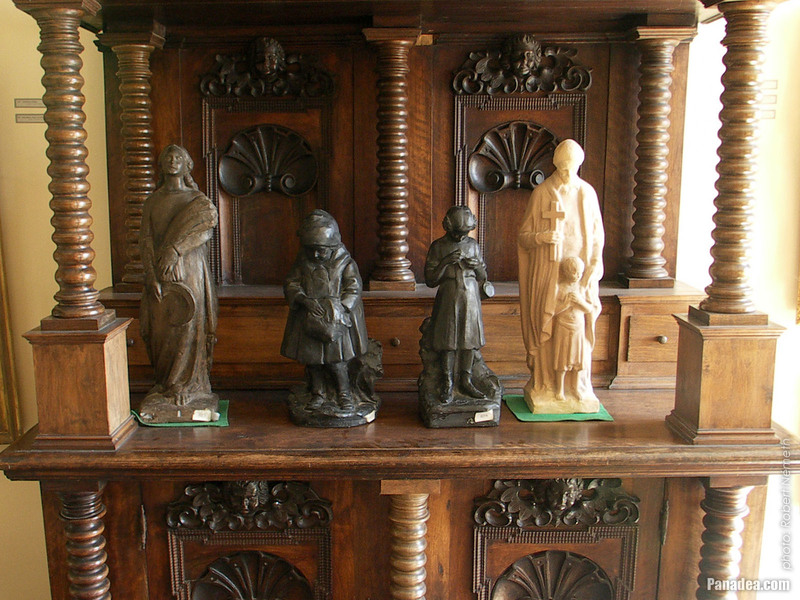 He learned from world-famous masters: sculpture from Alajos Stróbl and painting from Bertalan Székely. 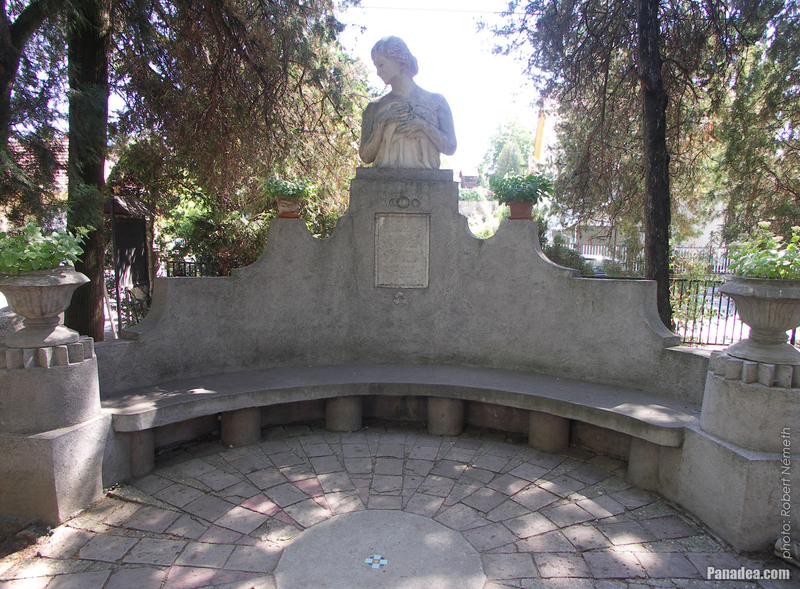 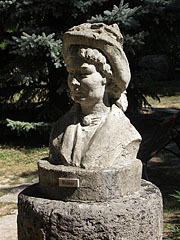 His wife was Ilona Komocsin (1885-1974), who was a painter and also the student of Bertalan Székely, and she first met Jenő Bory on this occasion. 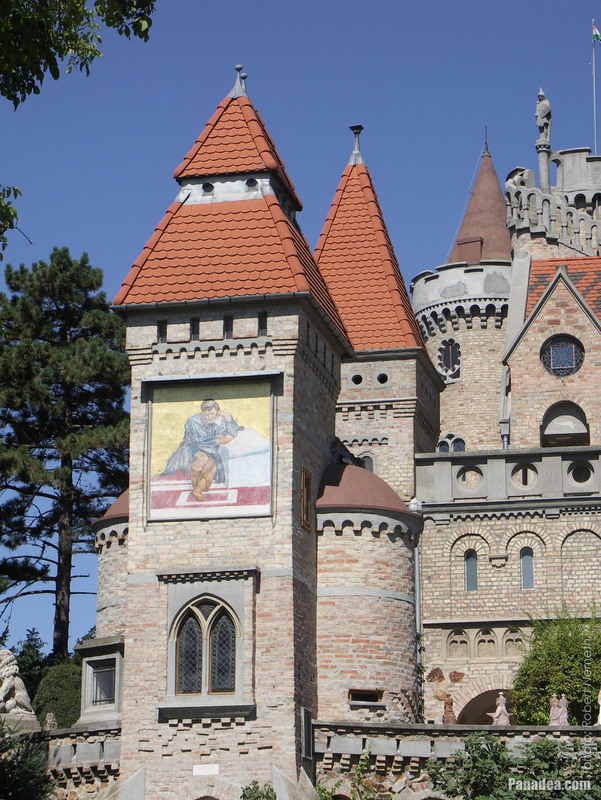 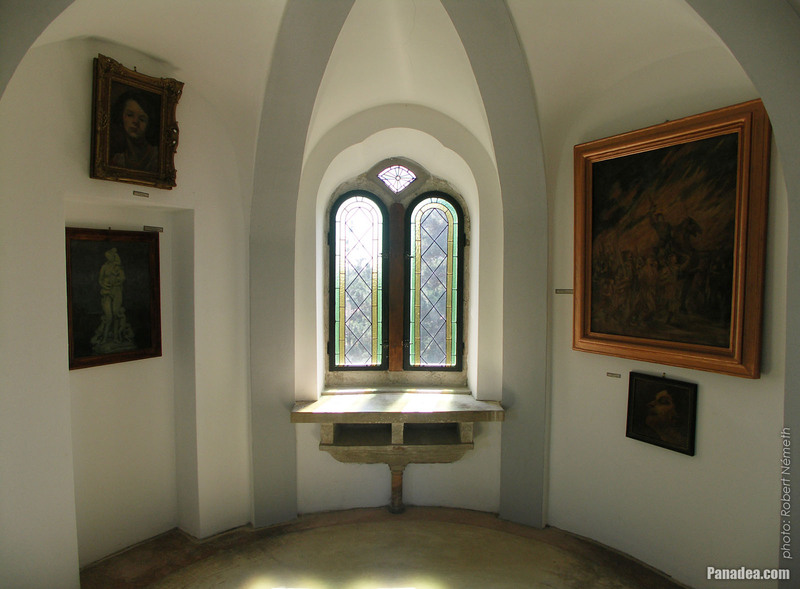 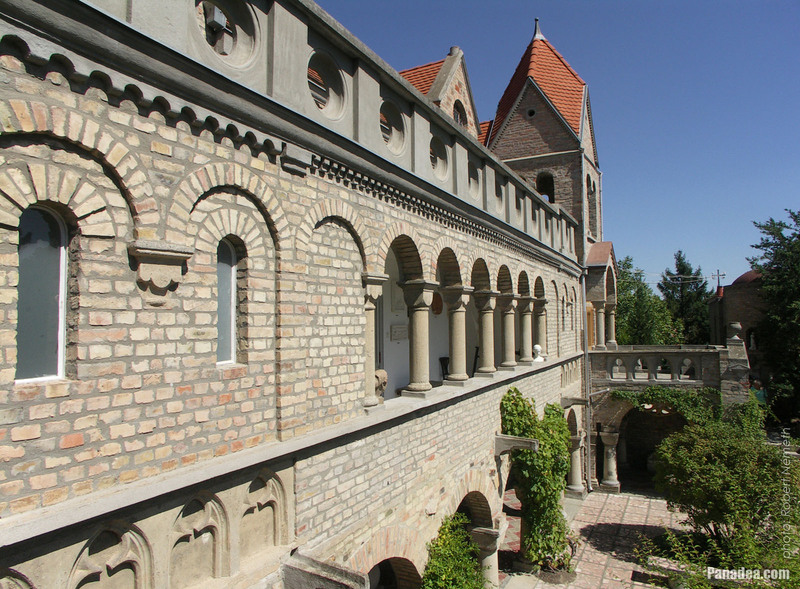 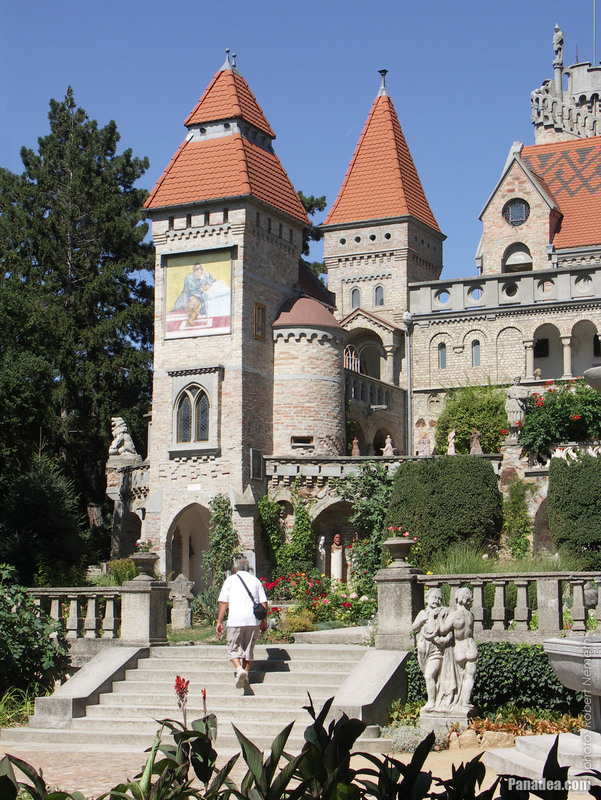 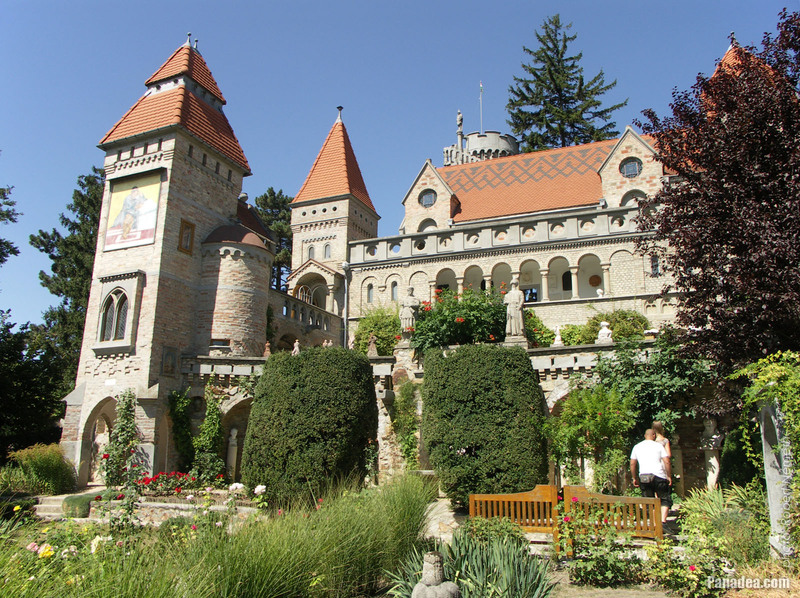 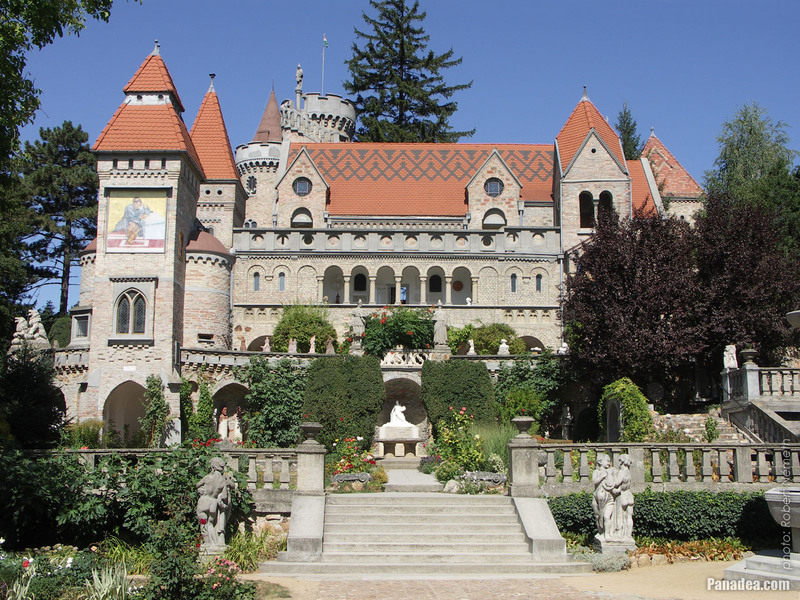 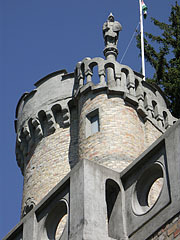 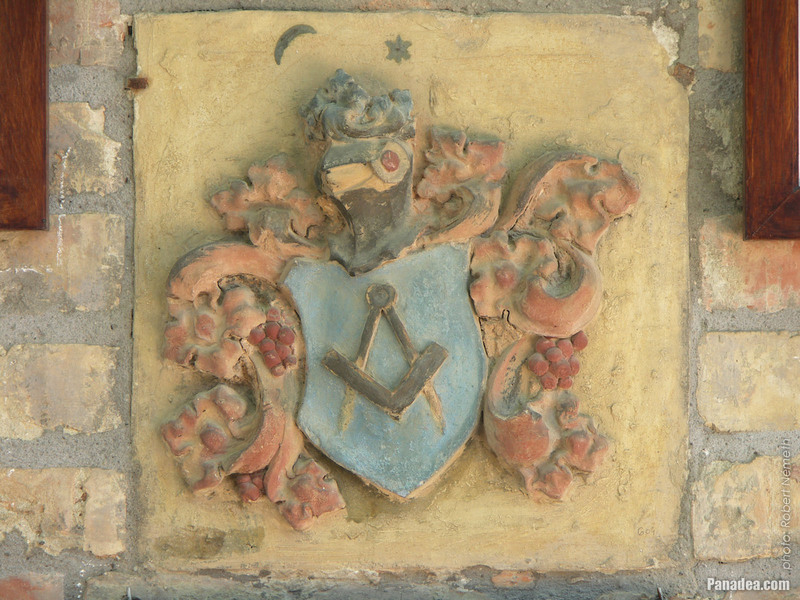 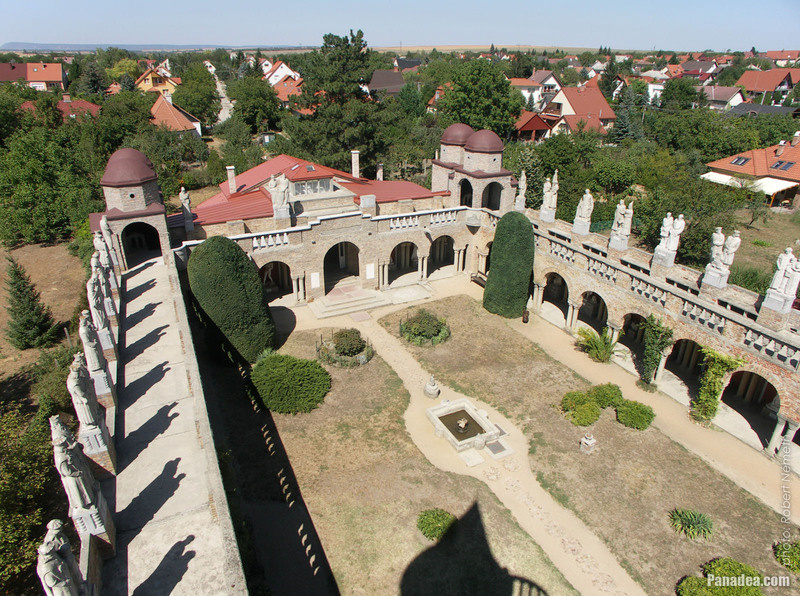 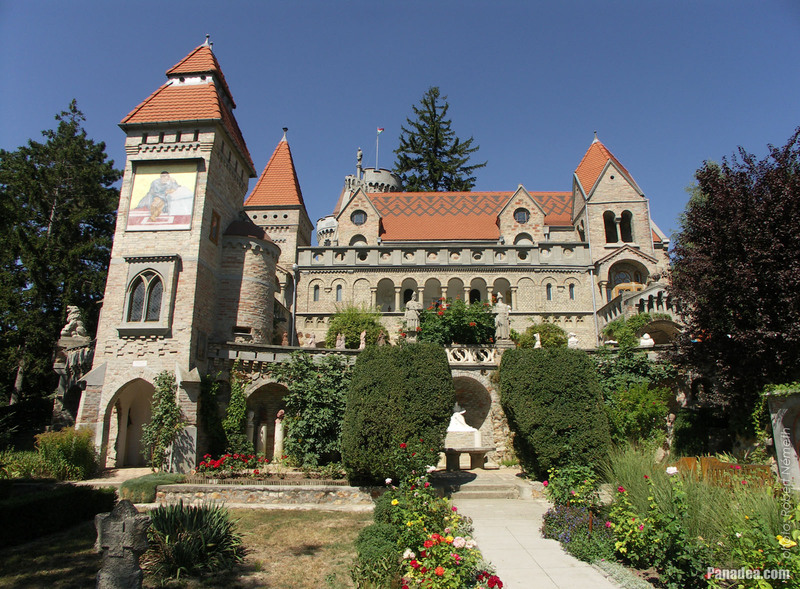 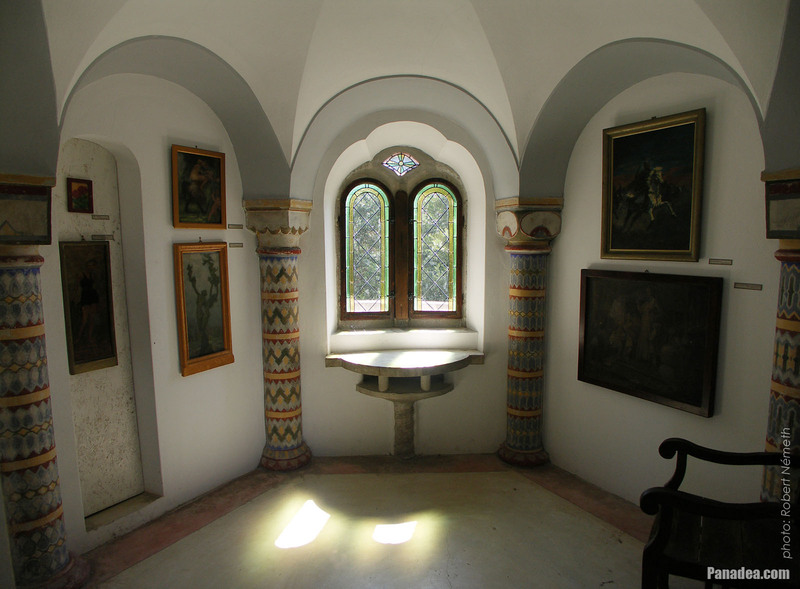 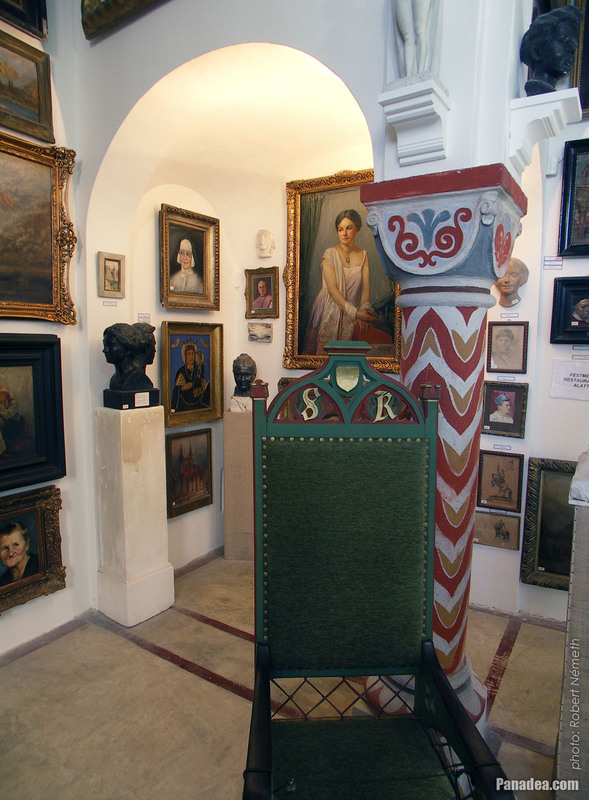 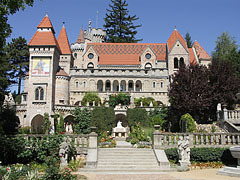 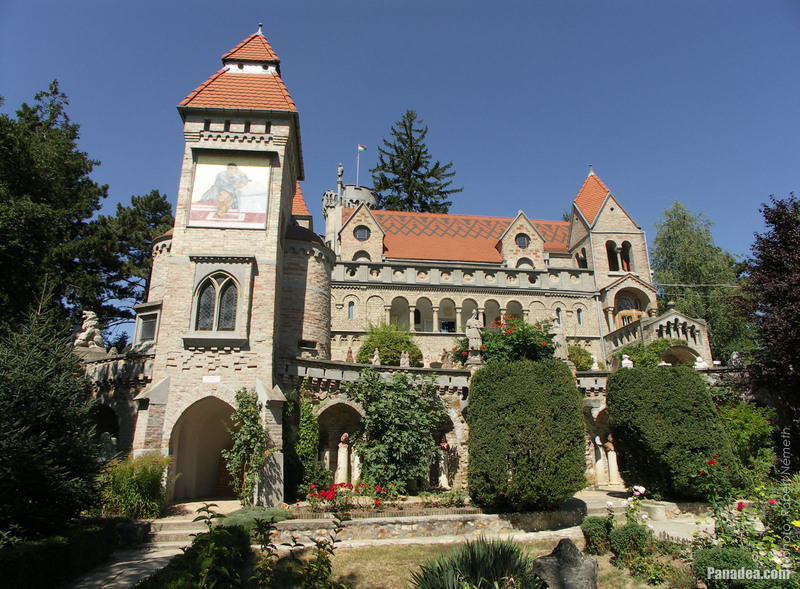 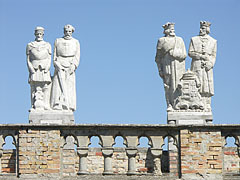 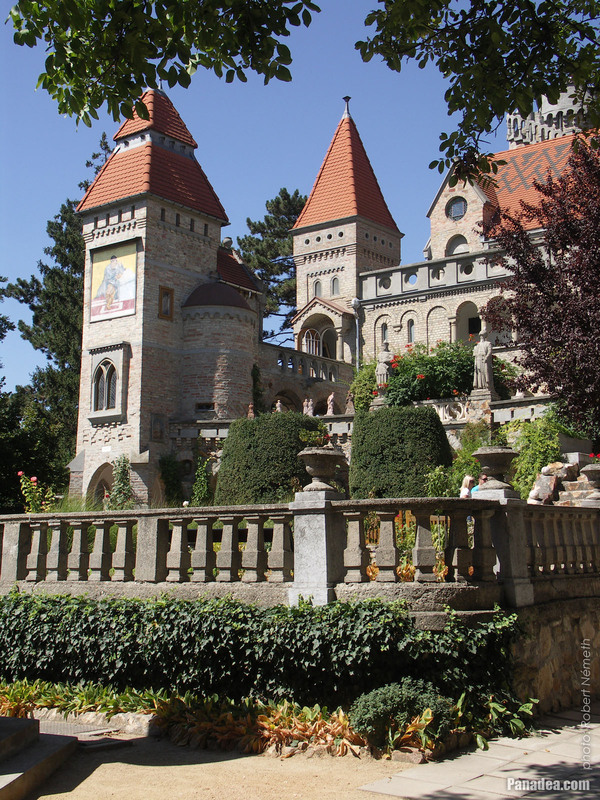 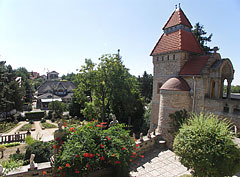 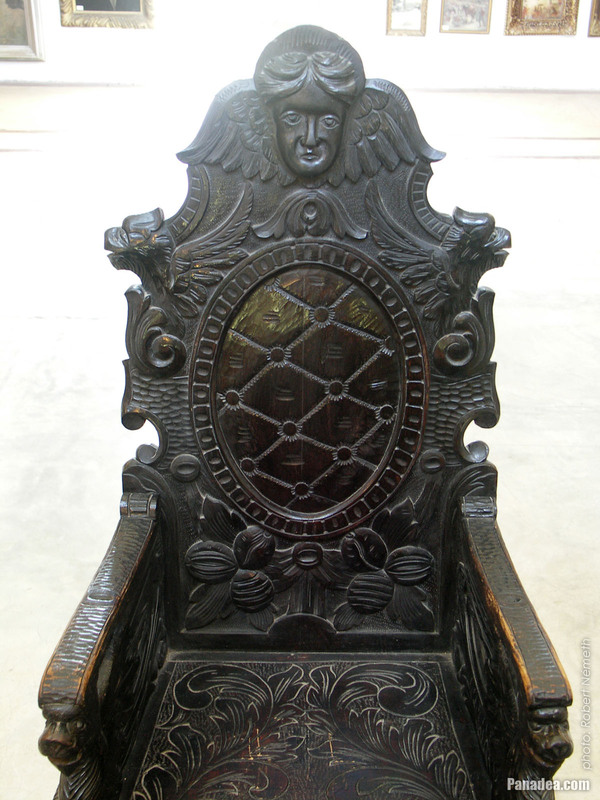 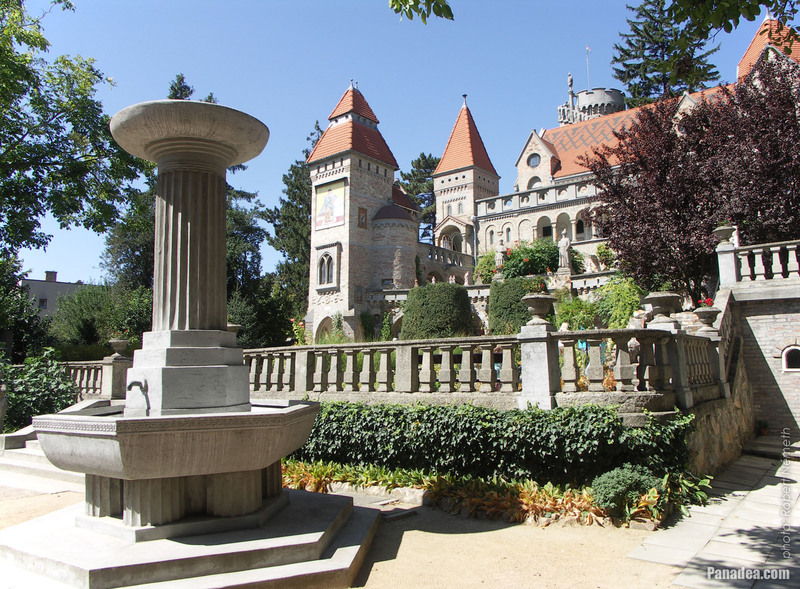 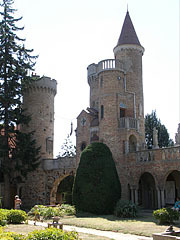 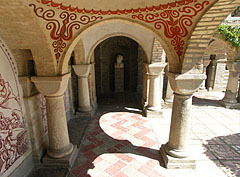 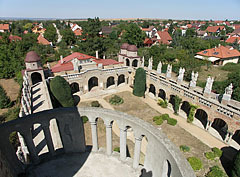 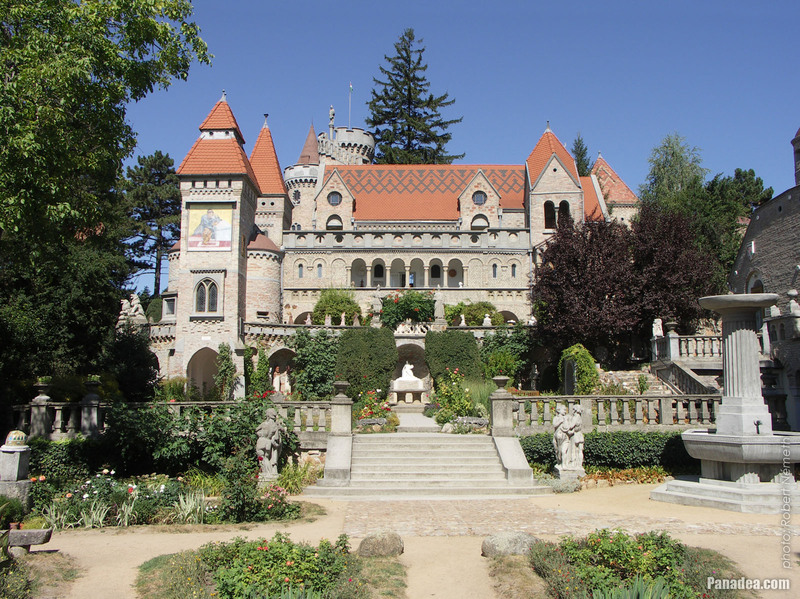 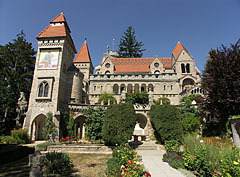 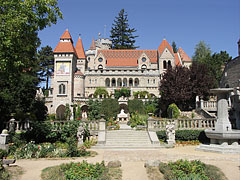 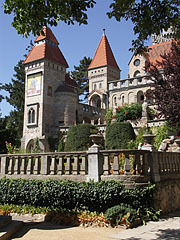 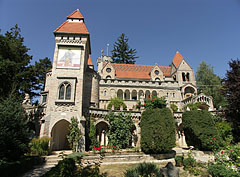 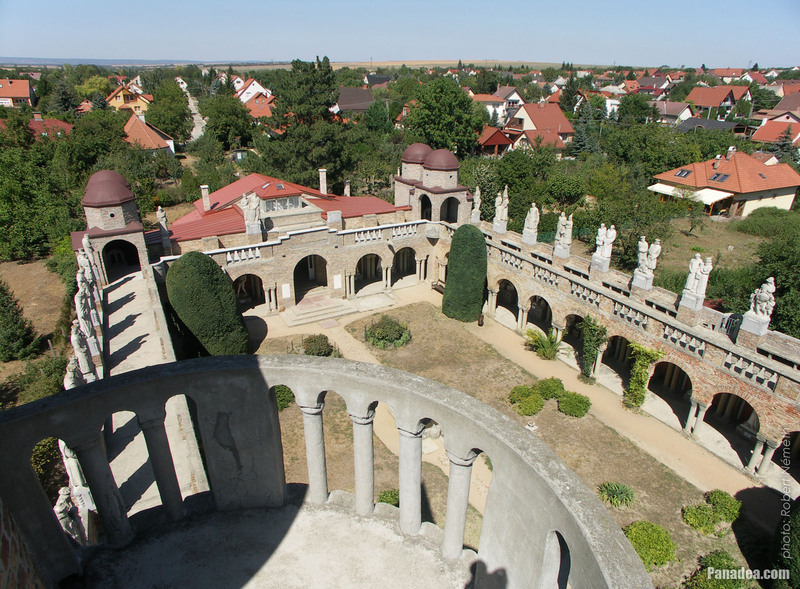 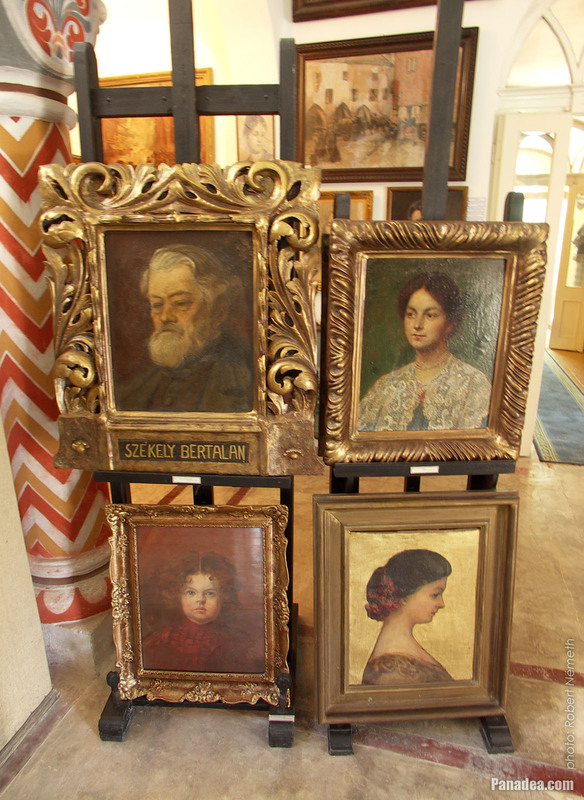 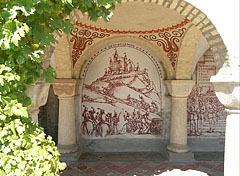 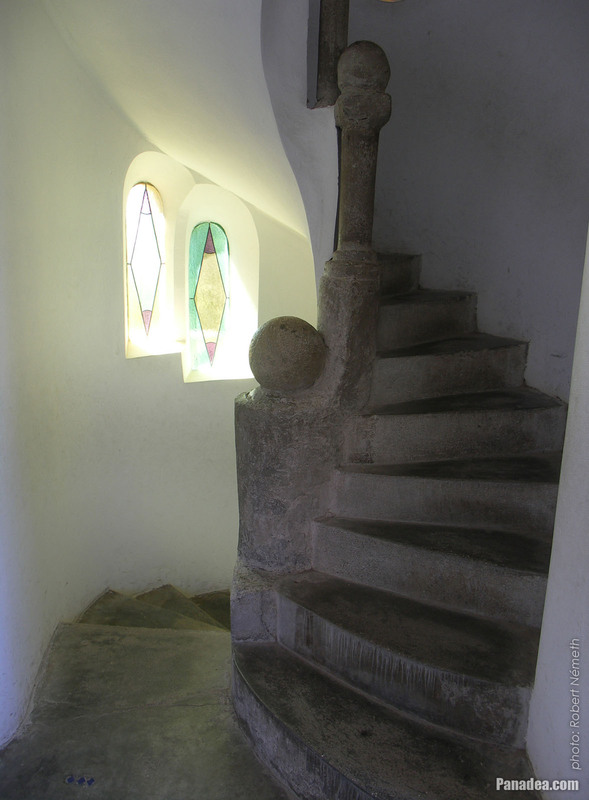 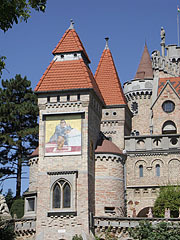 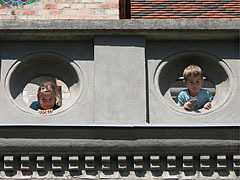 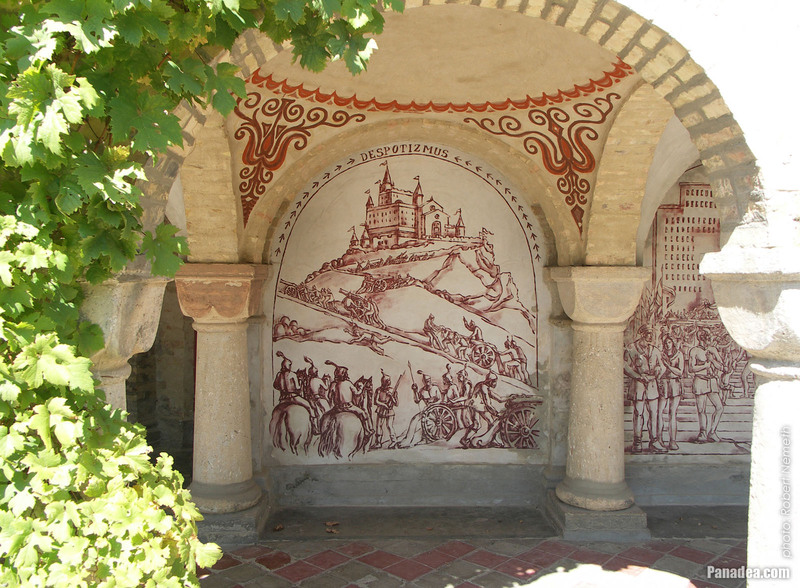 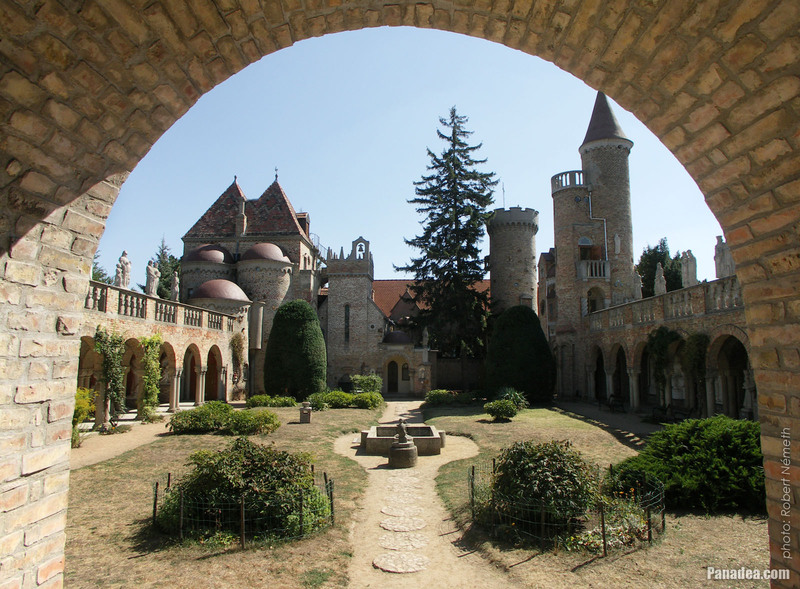 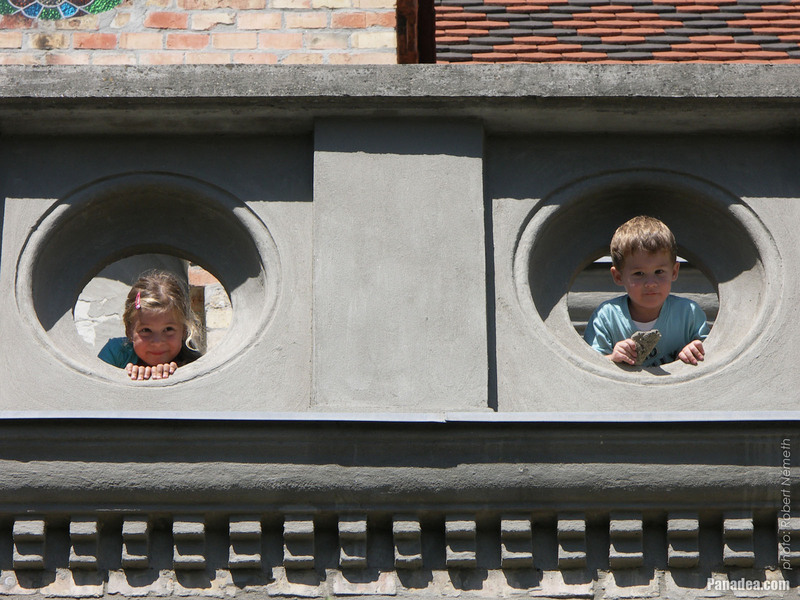 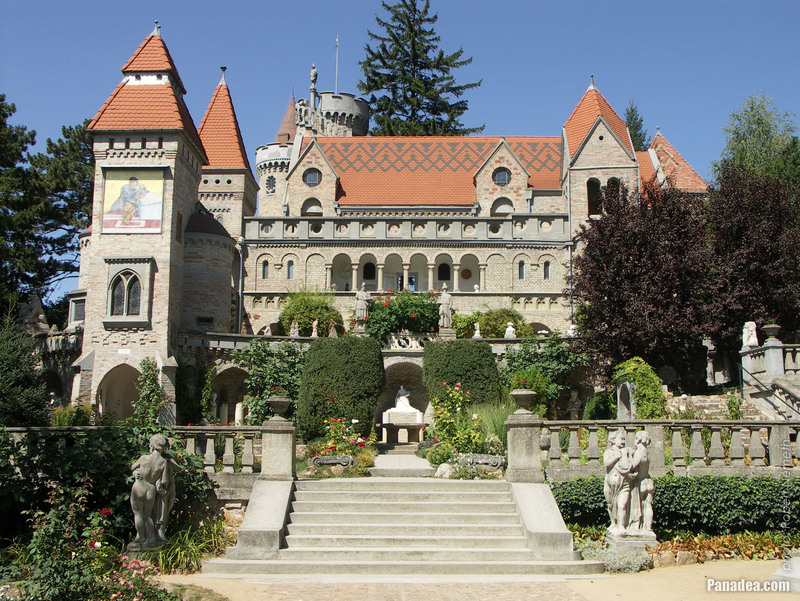 The artist couple from their own resources together created the famous Bory Castle ("Bory-vár") in Székesfehérvár, starting in 1923 and with 41 years of work. 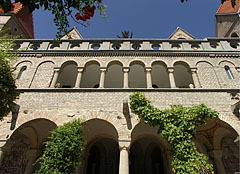 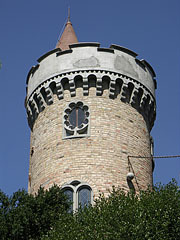 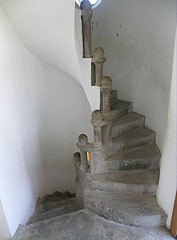 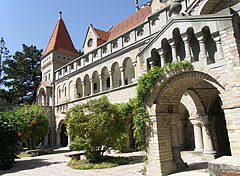 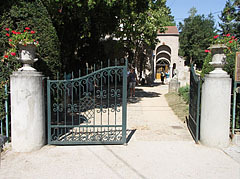 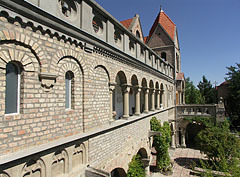 Because Jenő Bory curiously researched the wide range of application of the concrete and ferro-concrete (reinforced-concrete), he chose this building material for the Bory Castle as well. 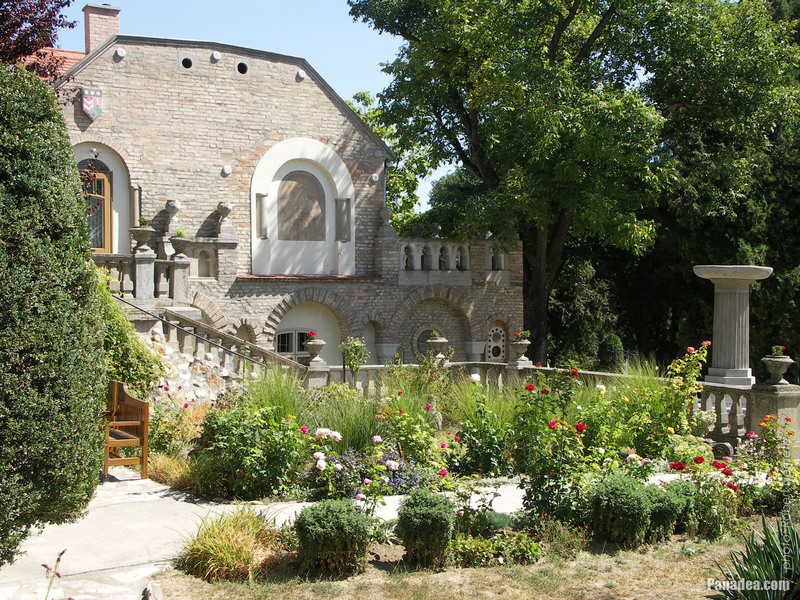 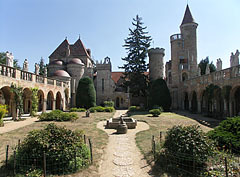 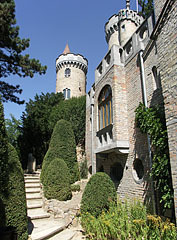 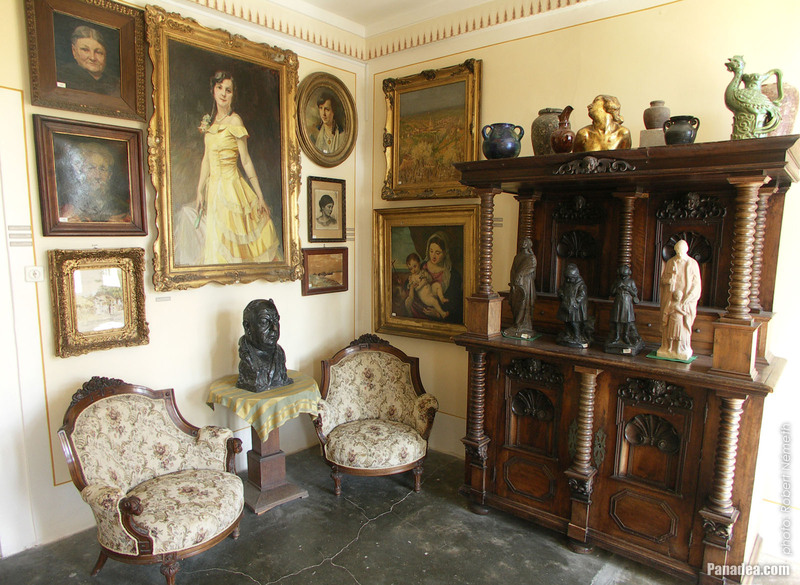 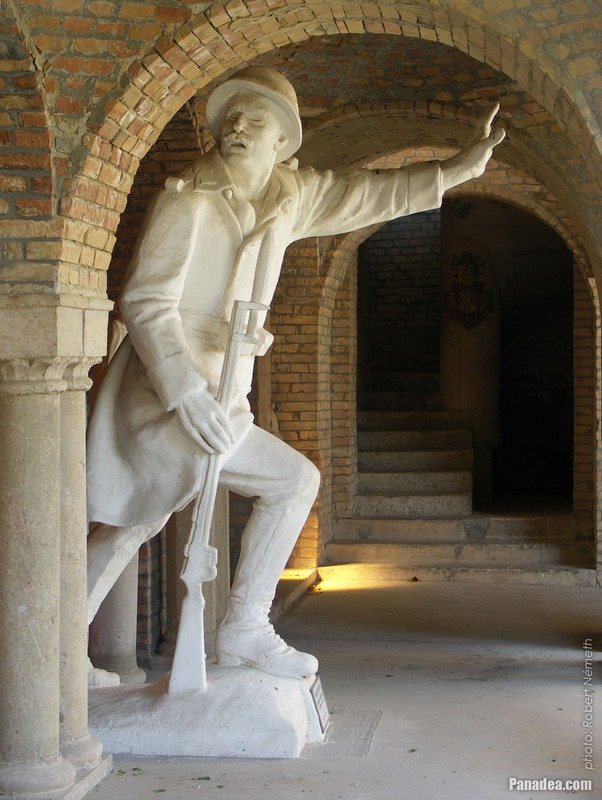 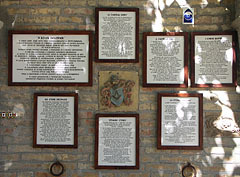 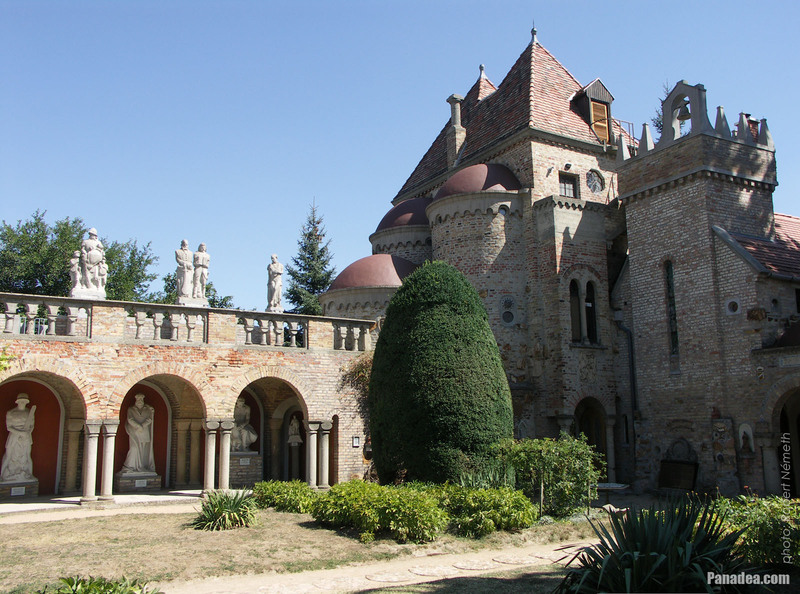 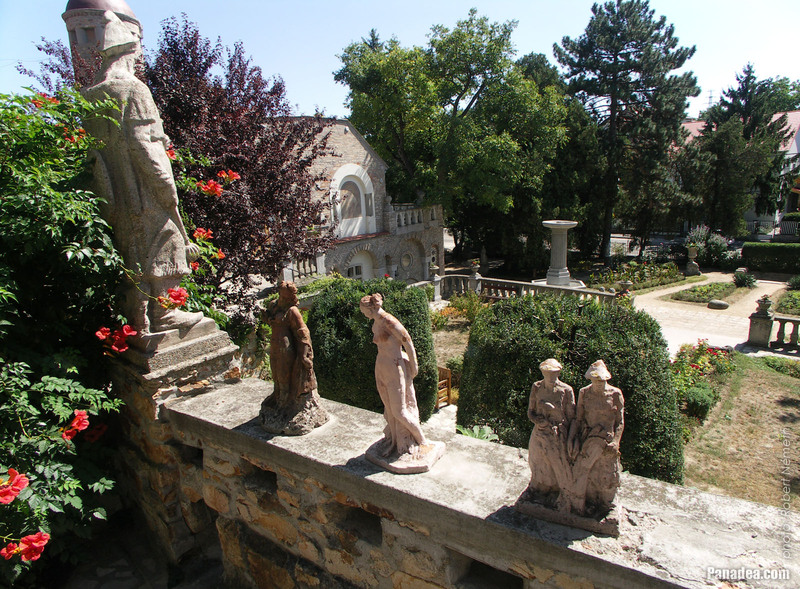 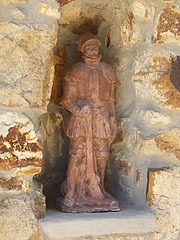 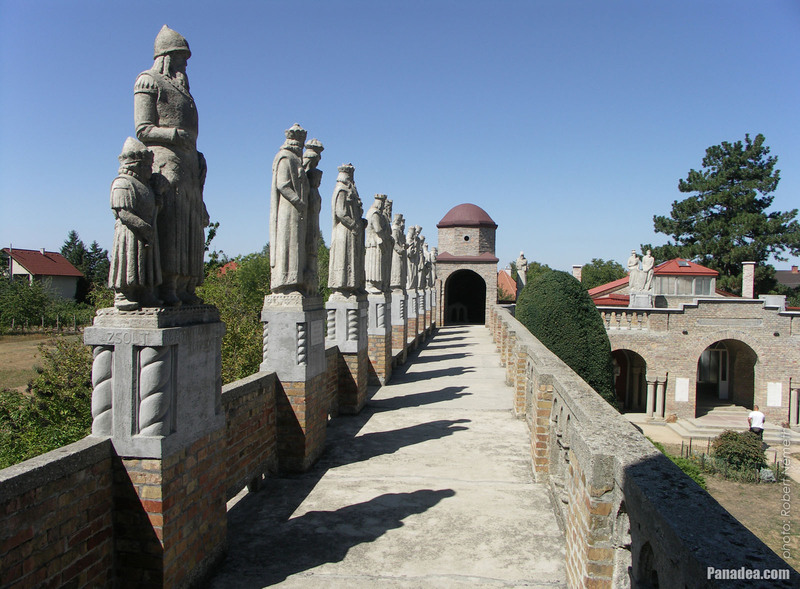 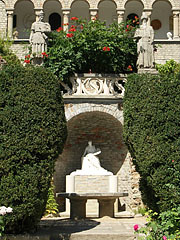 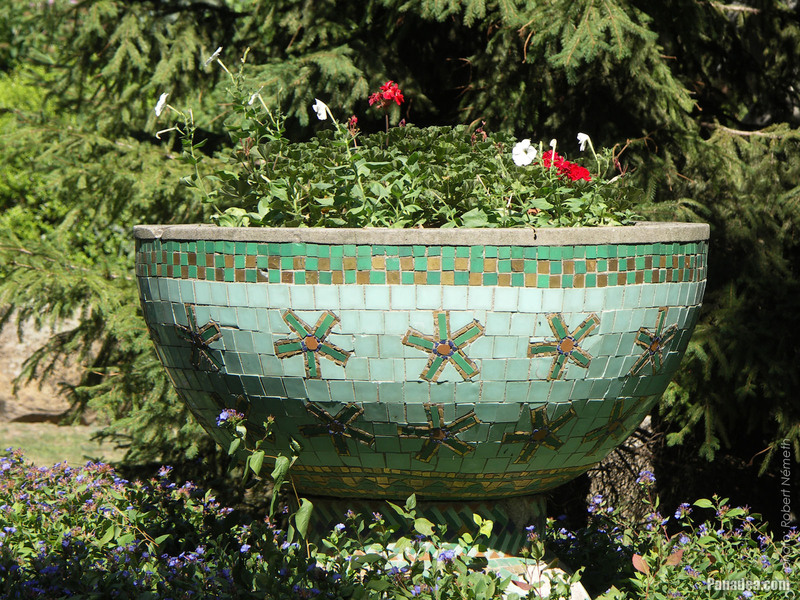 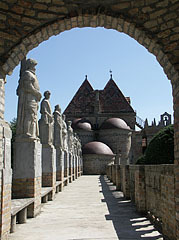 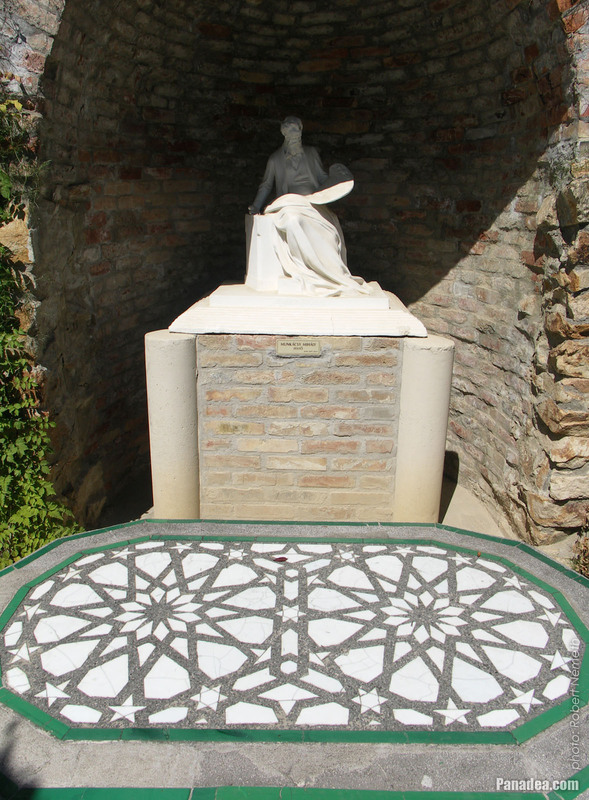 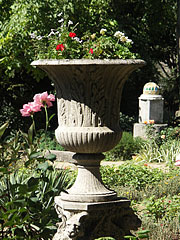 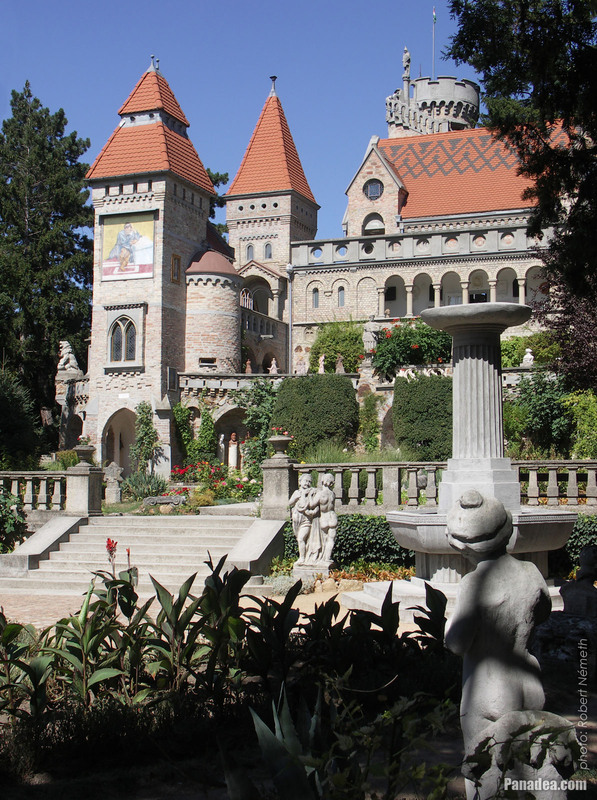 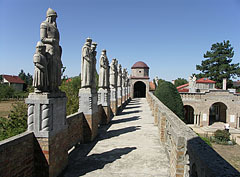 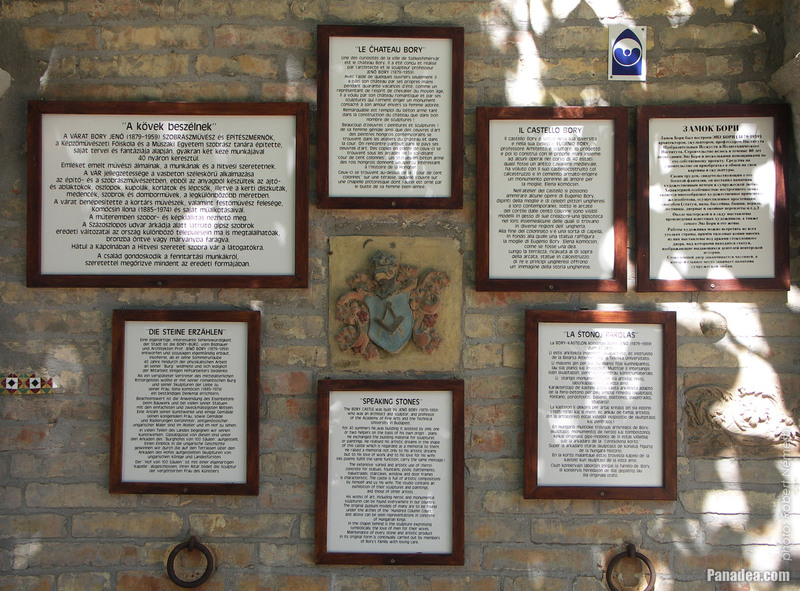 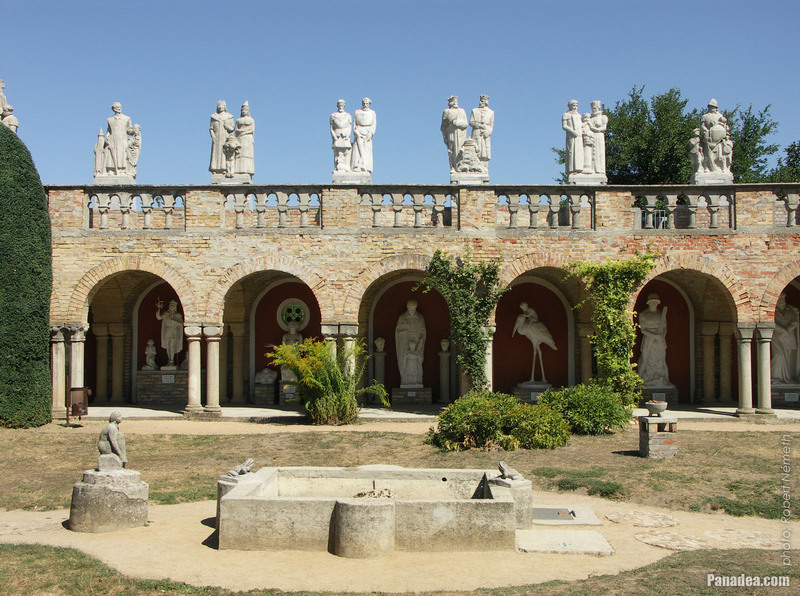 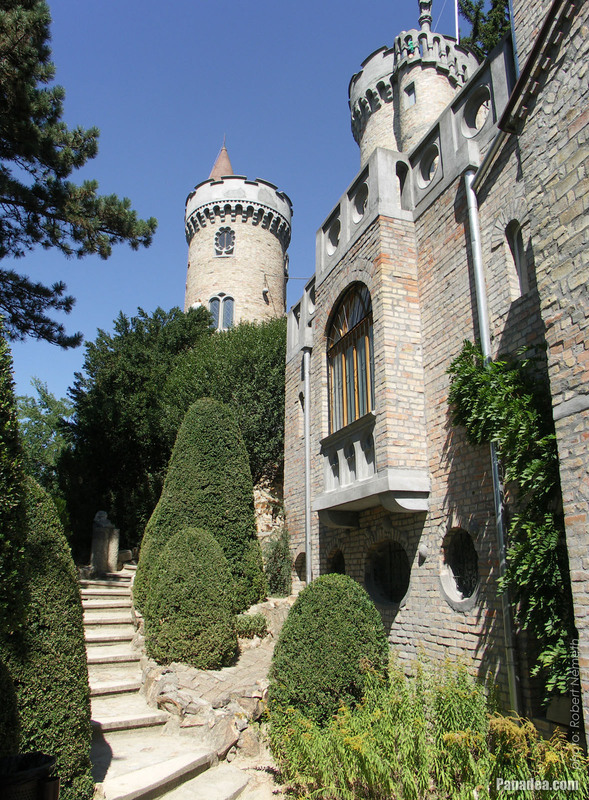 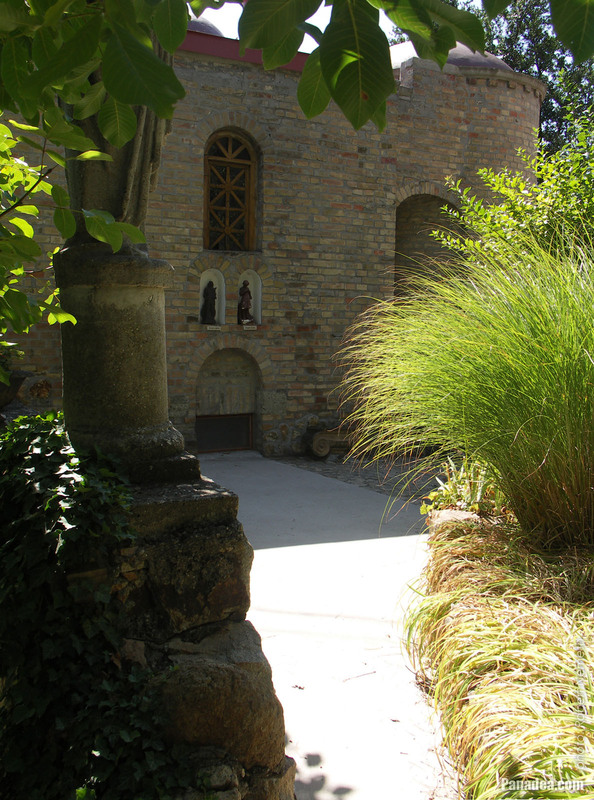 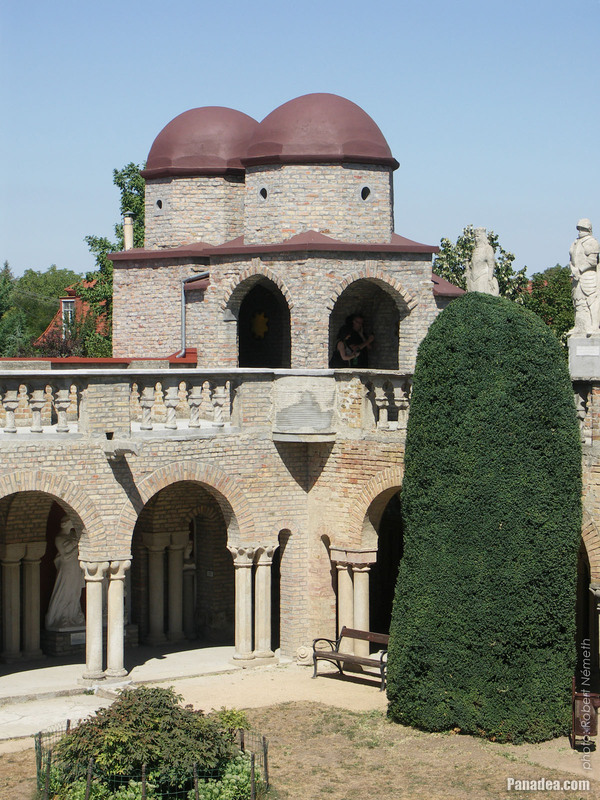 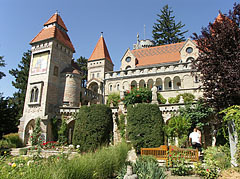 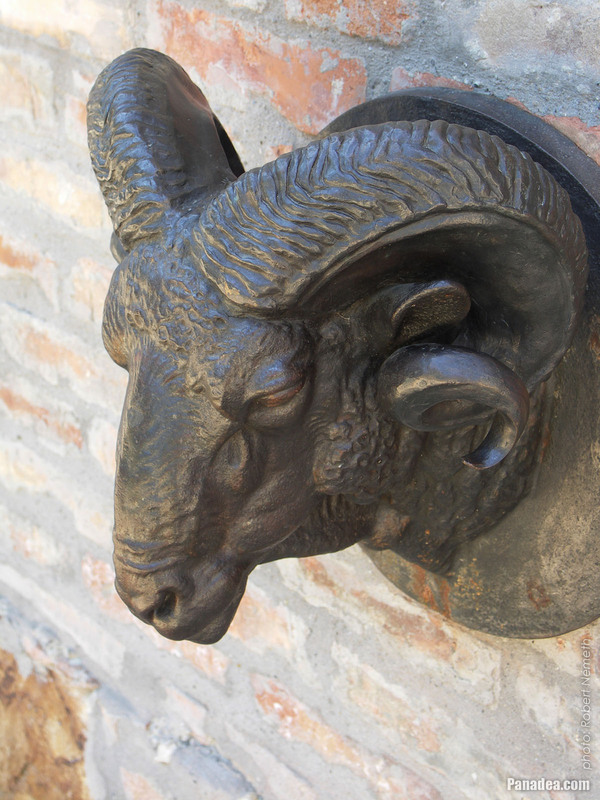 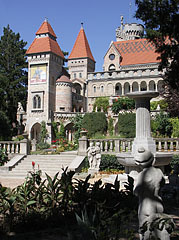 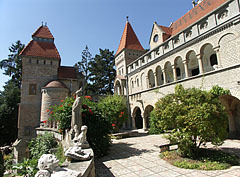 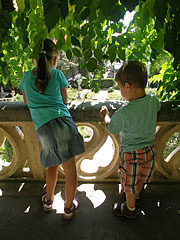 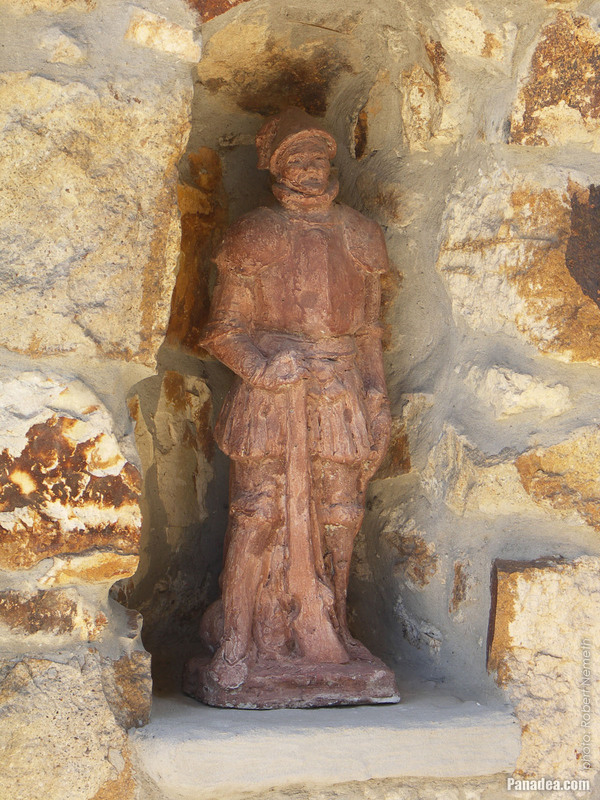 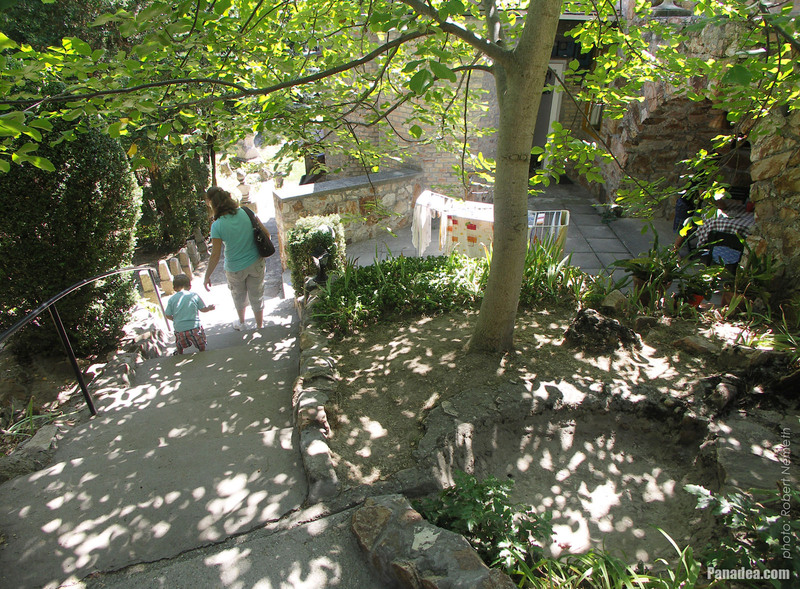 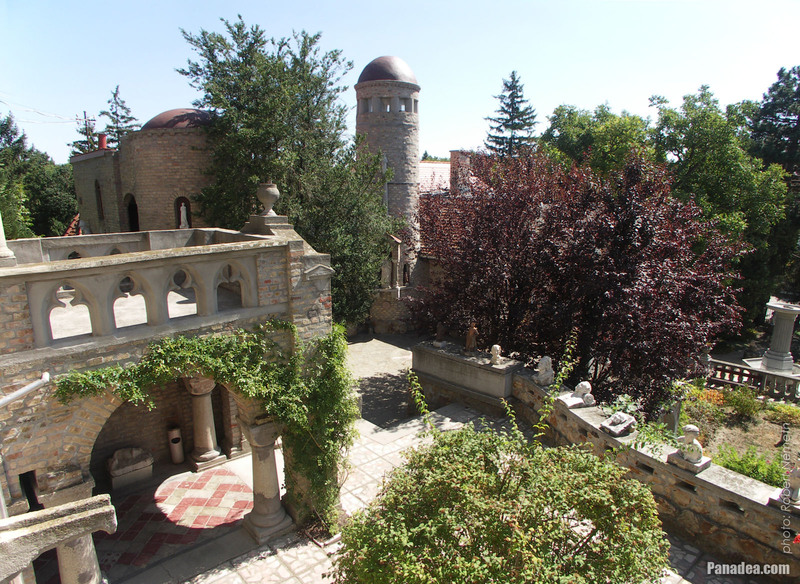 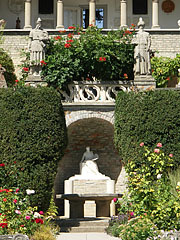 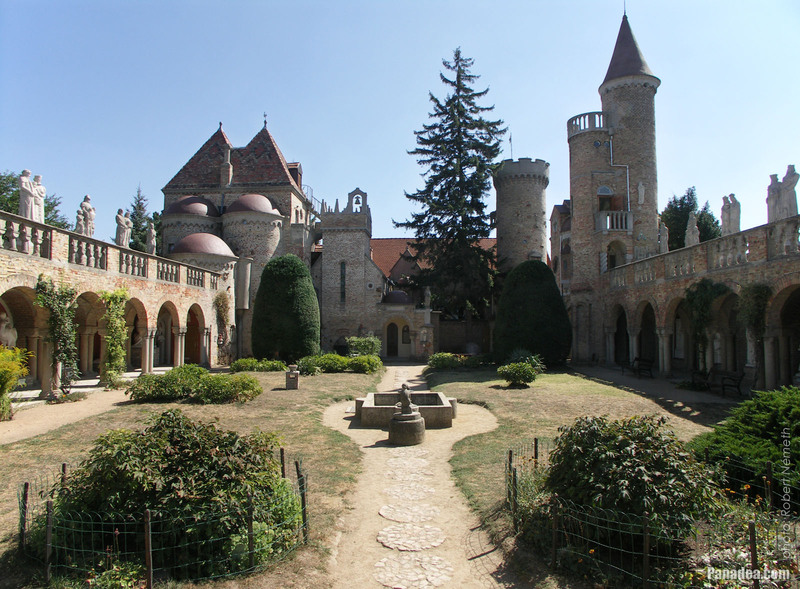 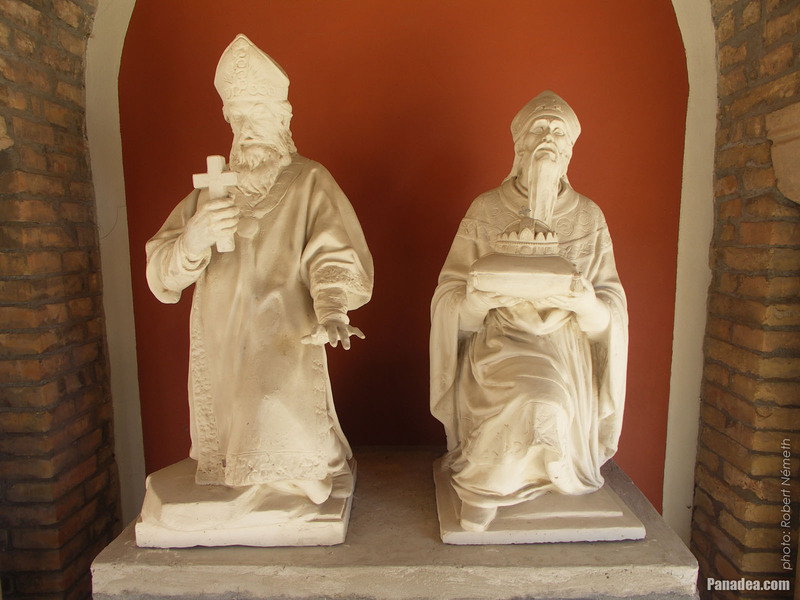 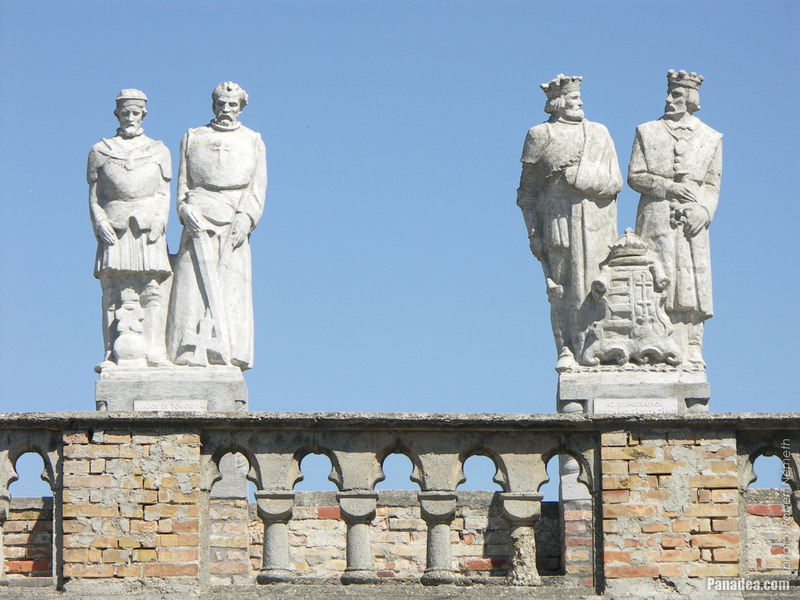 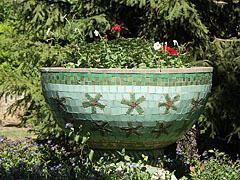 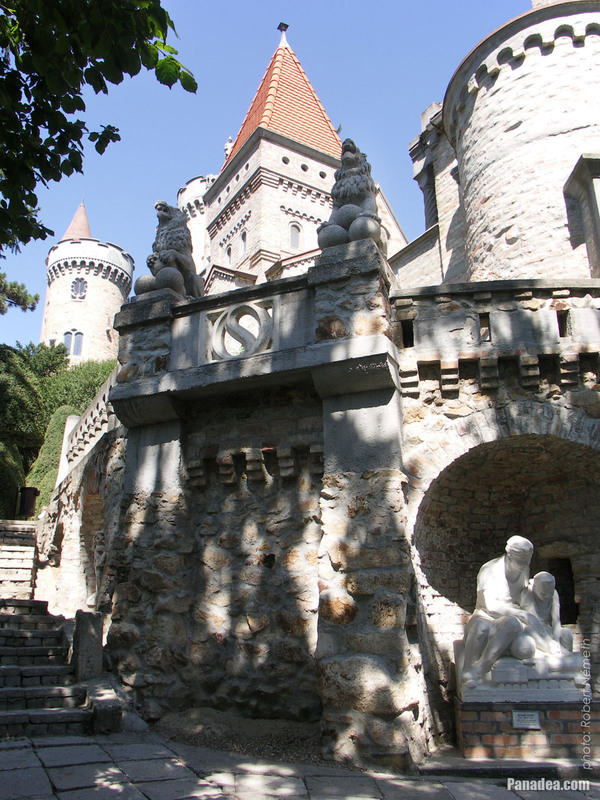 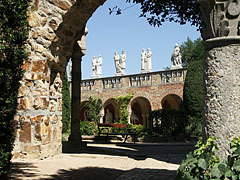 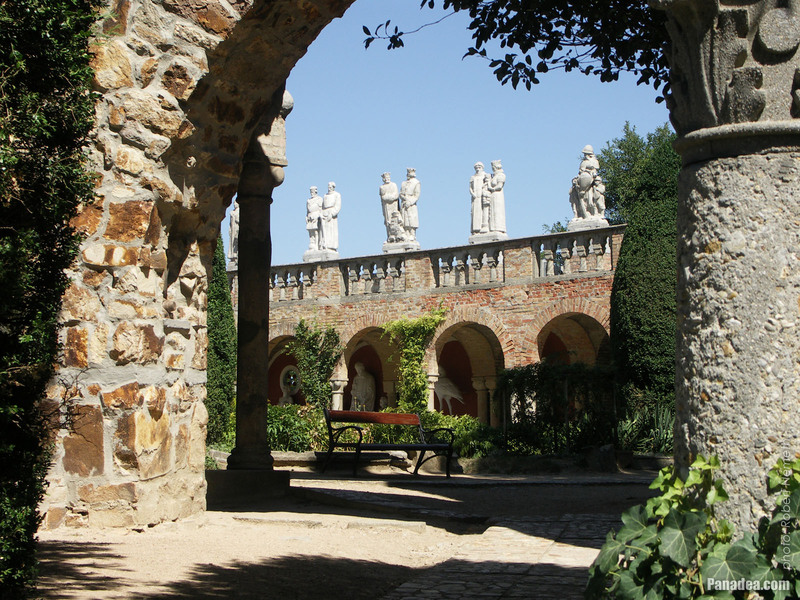 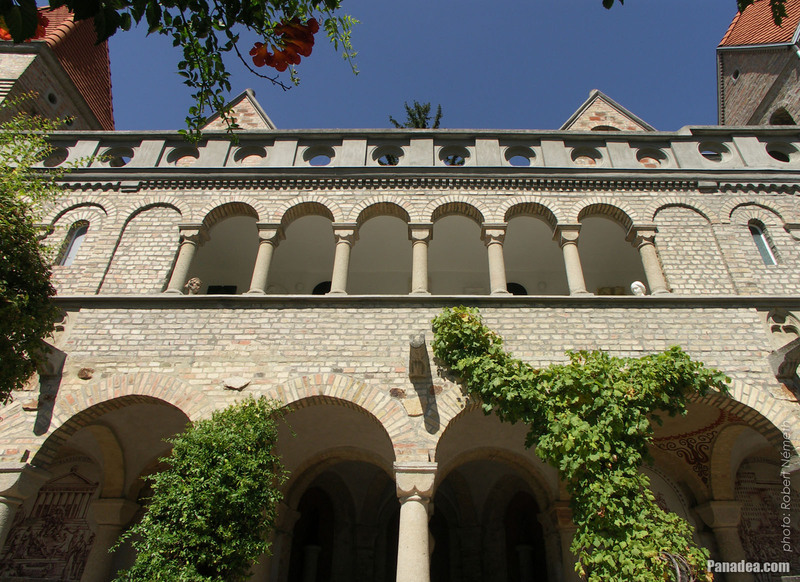 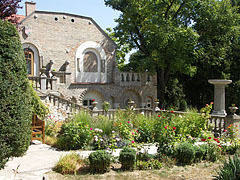 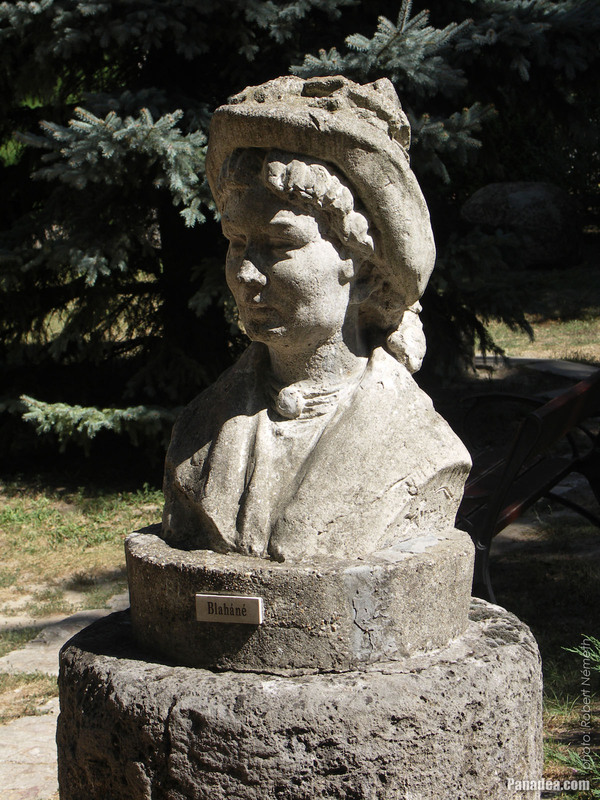 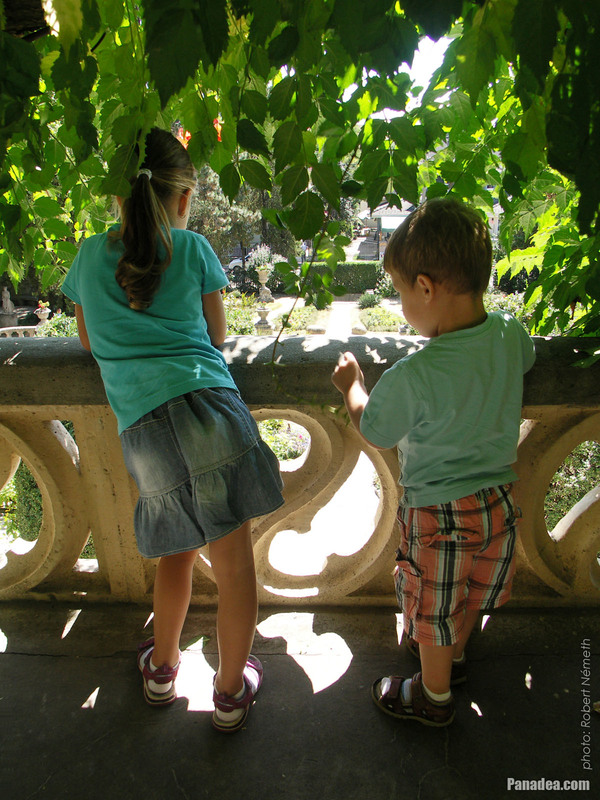 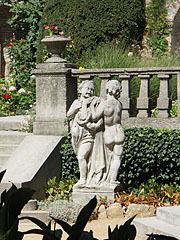 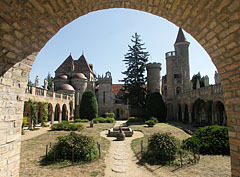 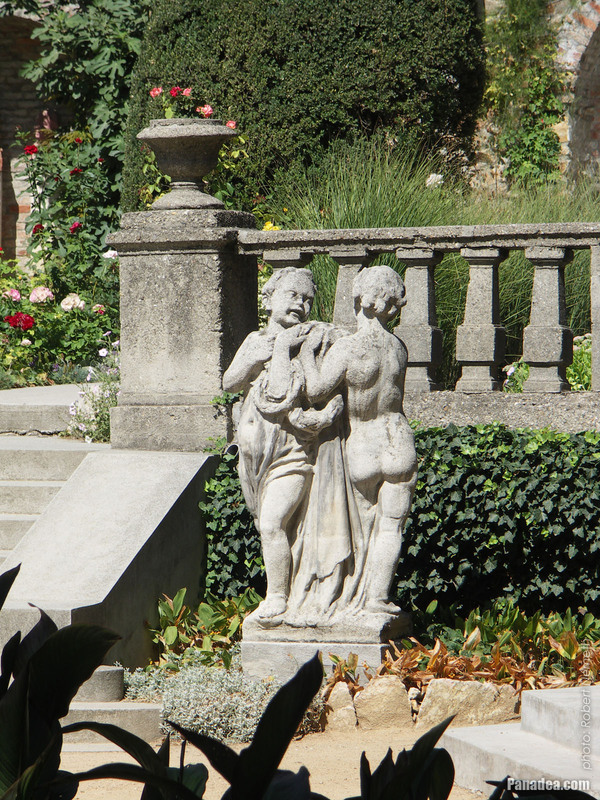 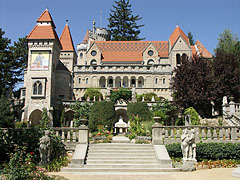 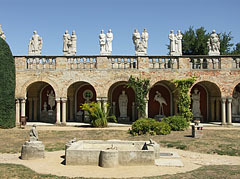 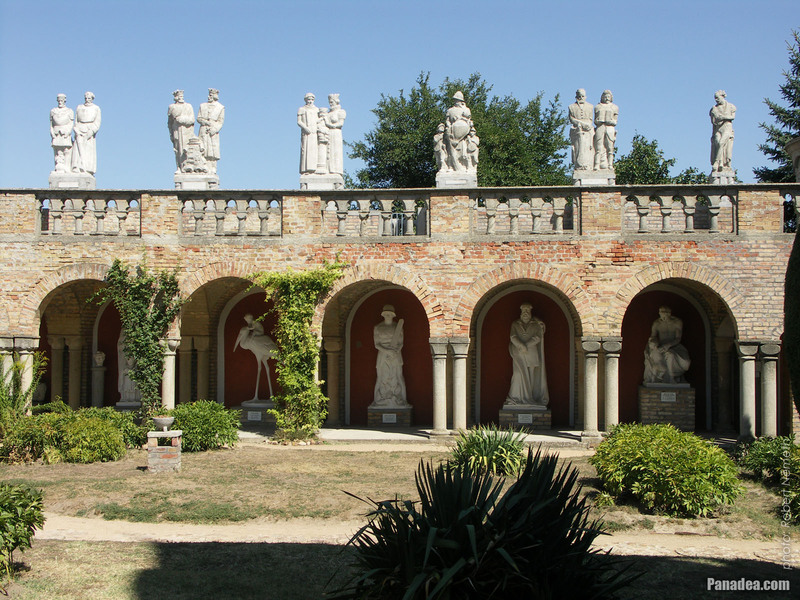 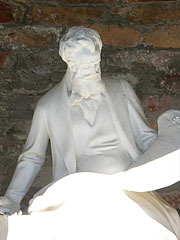 The castle and the garden is full of the many sculptures of Jenő Bory, as well as paintings created by his beloved wife and other artists. 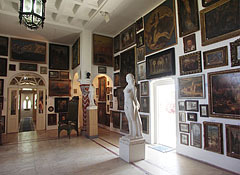 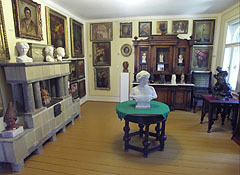 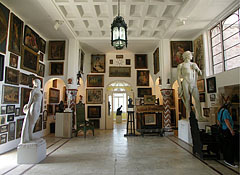 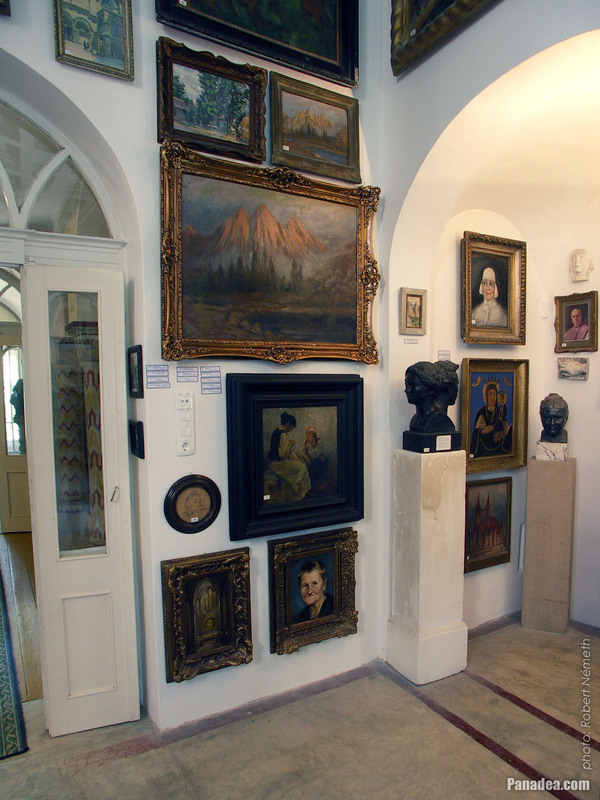 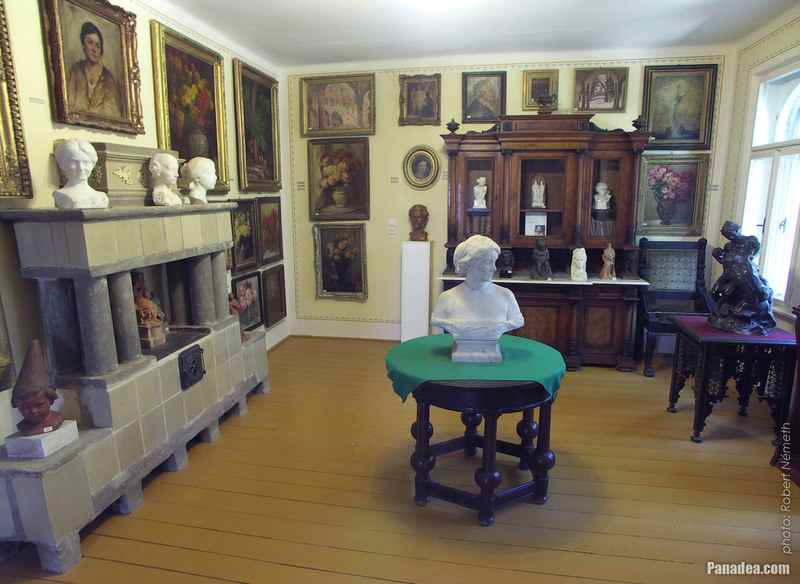 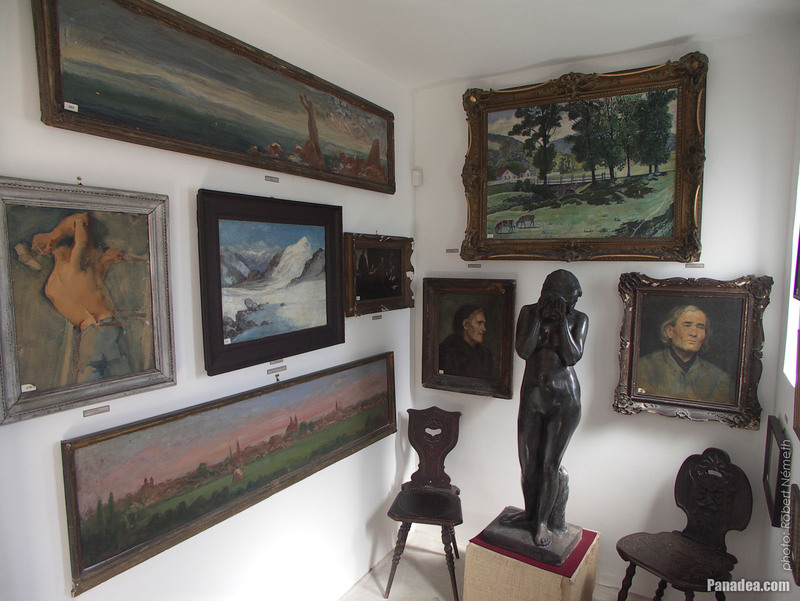 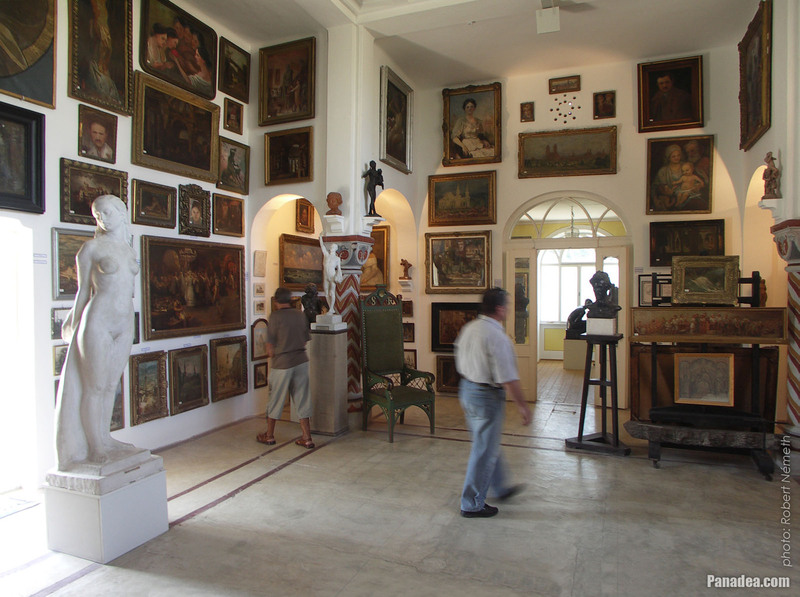 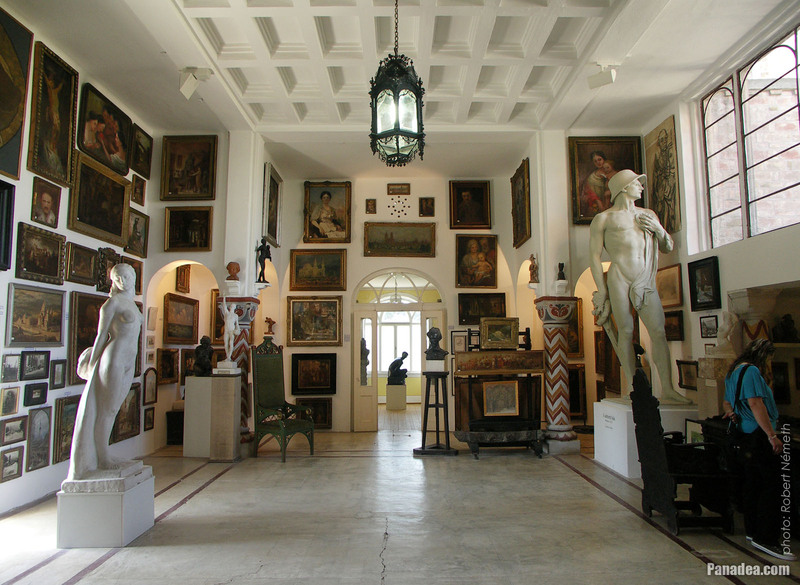 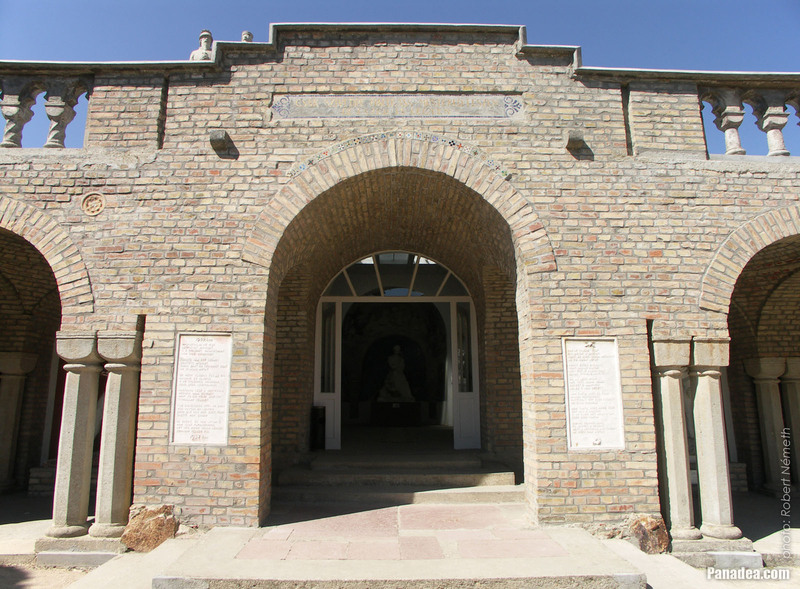 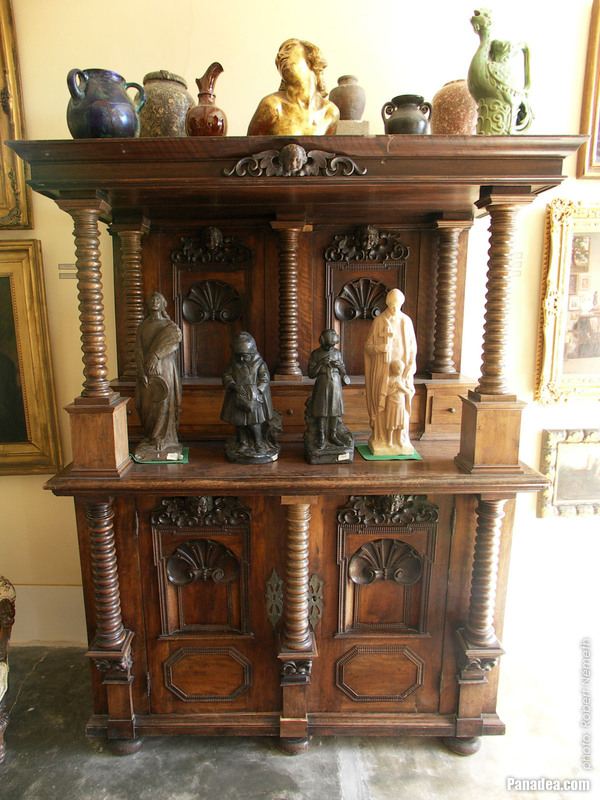 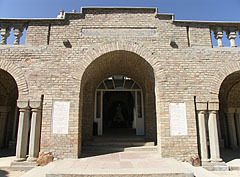 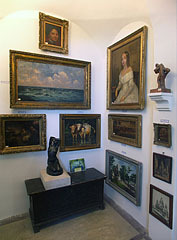 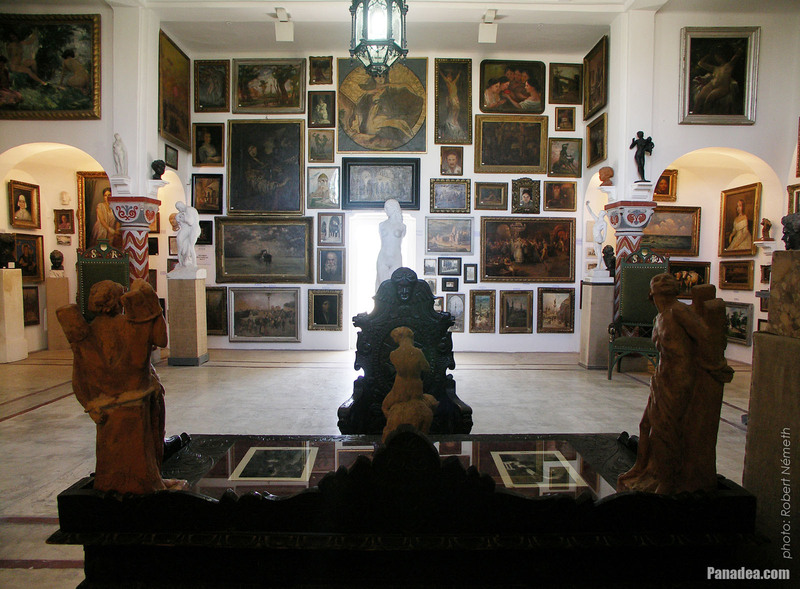 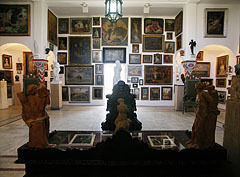 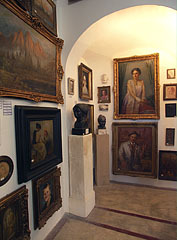 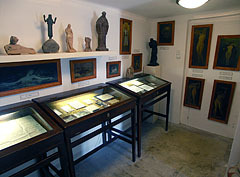 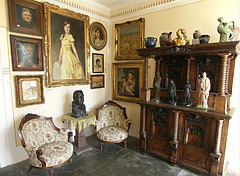 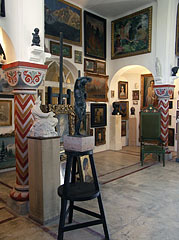 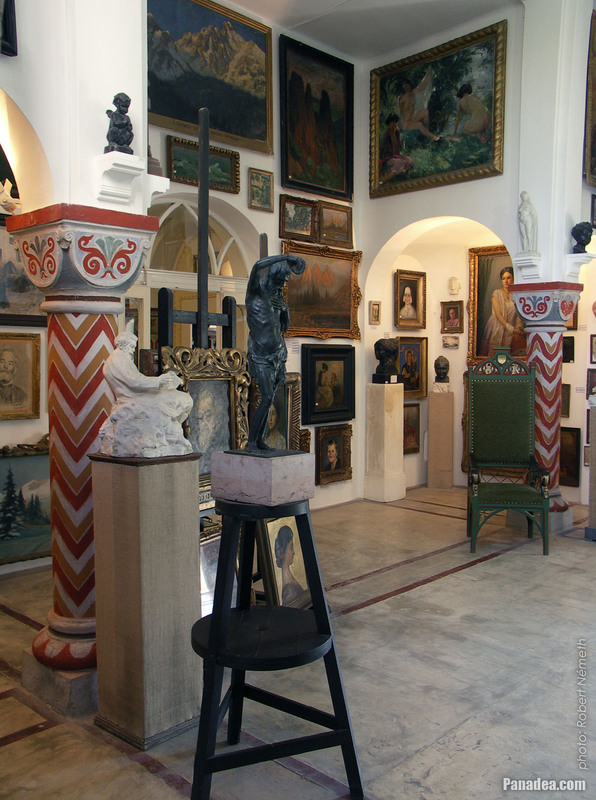 These together constitute a large, incredibly interesting and varied collection, actually a complete art gallery.